On top of a very muddy Mill Hill, there was little to see: a distant Robin Redbreast showed through the bare thorn, decorated with Old Man's Beard. The sheep had been moved to nearer the road and some had mouths full of long dry straw and others were nibblng at the short green turf. 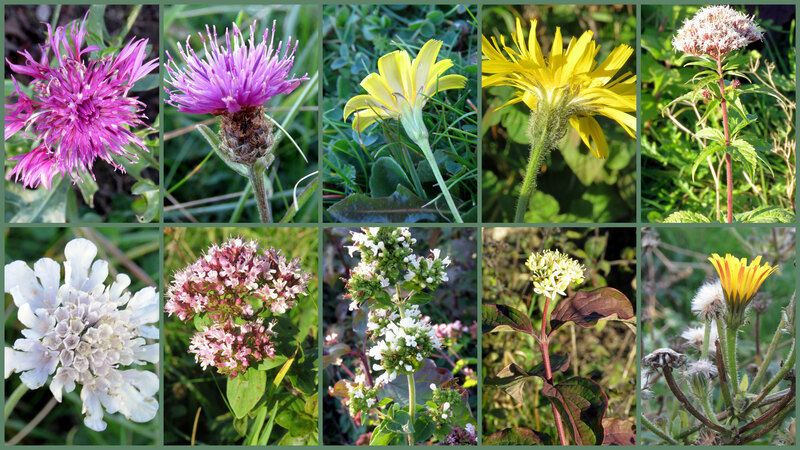 A few flowers were hanging on: Hawkweed Ox-tongue, Bristly Ox-tongue, Common Ragwort and Marjoram on the middle slopes. After three days of rain and winds gusting to Gale Force 8 the weather brightened up and there was a Clouded Yellow and a Peacock Butterfly on the lower slopes of Mill Hill around midday. 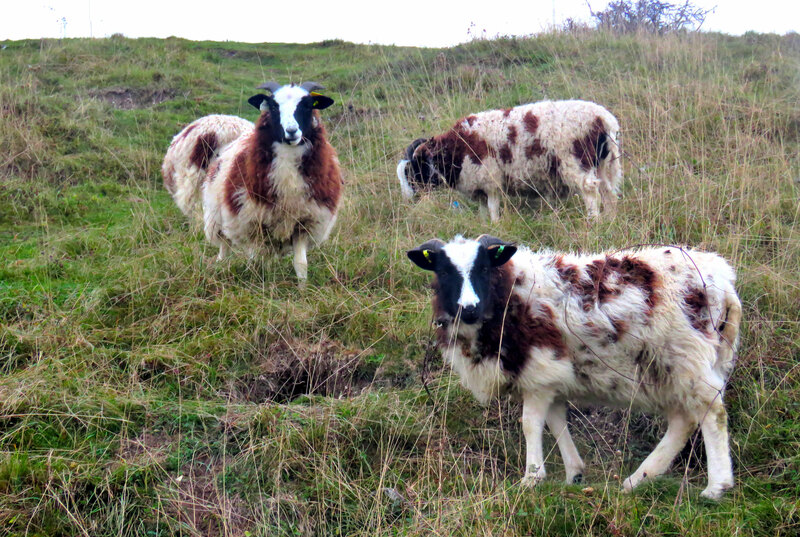 A flock of about 24 Jacob sheep were feeding on coarse grass in a temporary fenced enclosure over rough cleared terrain on the middle slopes just above the ridge footpath on Mill Hill. The weather was inclement, with an easterly wind chill not much above freezing in the early afternoon, with low grey clouds and poor light making photography unsatisfactory. On a misty cool day, the usual Kestrel hovered over the road and flew over the New Erringham pastures. 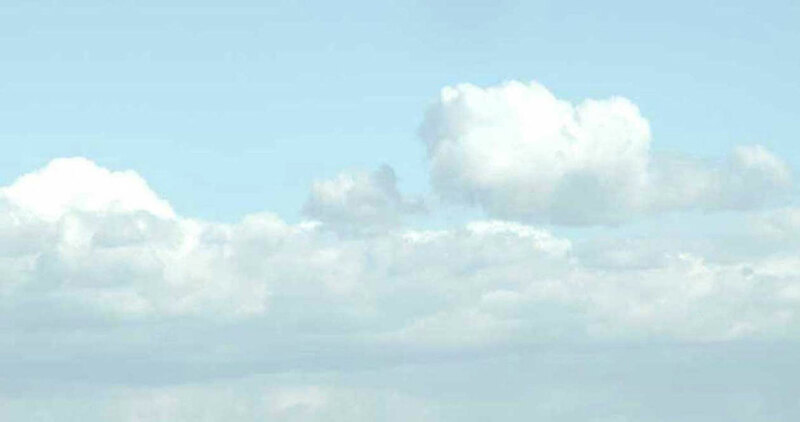 Again, there were too many large dogs over its usual Mill Hill ground. A flock of over fifty Rooks flew over, but it was too cool on the upper part of Mill Hill for any butterflies to be active in the afternoon. More images of the action from Mill Hill in the form of an ovipositing Clouded Yellow. Also seen were a further five male Clouded Yellows, three Common Blue, Brimstone and Comma. A return visit to Mill Hill (upper slope) at lunchtime produced another fairly fresh Clouded Yellow and a shy Speckled Wood. Ten days since my last visit to Mill Hill: the bright and breezy conditions produced two Clouded Yellow, Brown Argus, another fresh Common Blue and a Red Admiral. A quick trip to Mill Hill in the morning with the car thermometer at 13°C. With the sun out it was much warmer and I quickly spotted a Meadow Brown. A short while later a Peacock flew by. There were several Clouded Yellows and perhaps half a dozen Common Blues of both sexes. One male looked remarkably fresh. 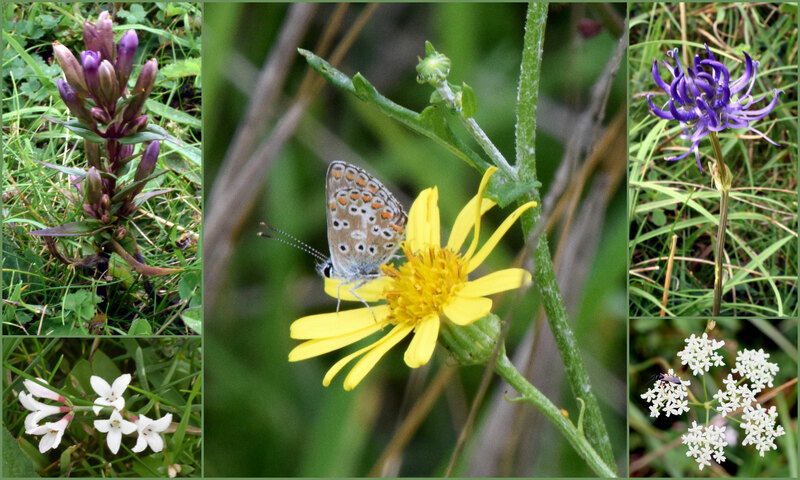 Under an overcast sky without any heat from the sun, I managed to spot a worn male Common Blue Butterfly resting on a Common Ragwort in flower on the lower slopes. Common Groundsel was added to the plant list with a single small plant next to the path on the lower slopes. 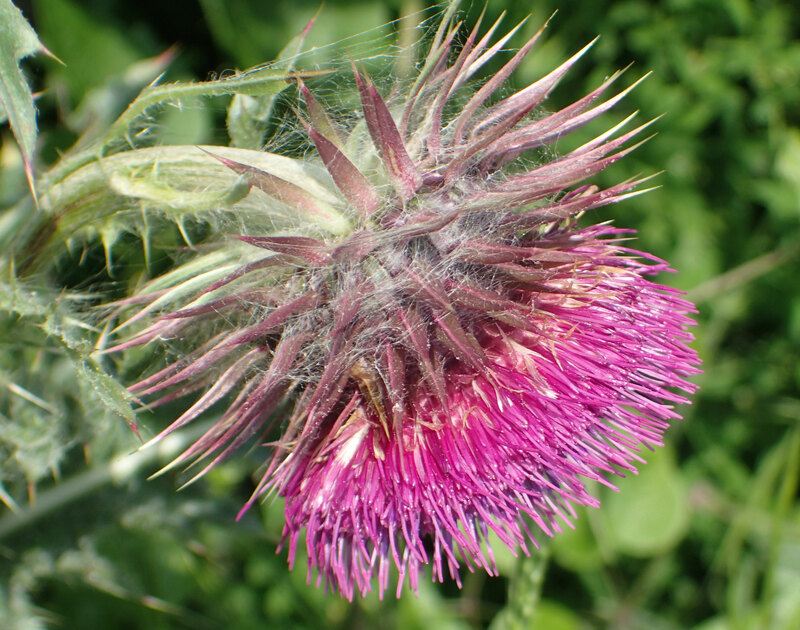 There were frequent stands of Carline Thistle with silver stems and leaves, or bronze stems or leaves on some. An Eupeodes hoverfly visited a Sow Thistle. There were two Kestrels very high in the grey sky over Mill Hill. Again the dogs prevailed and they were becoming a real problem with too many dogs, too many faeces and a pair of dangerous dogs under control, but off lead. 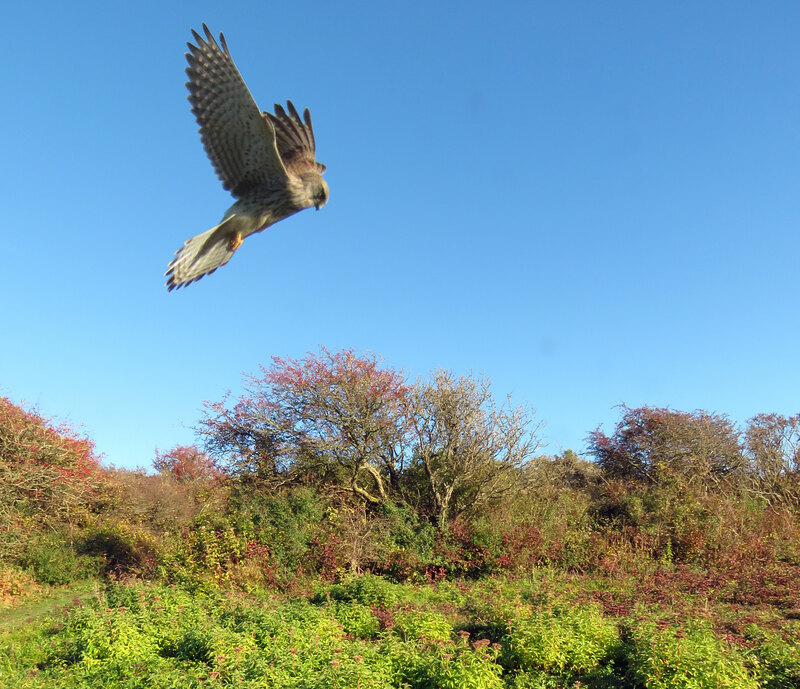 The Kestrel hunting over the top of Mill Hill did not seem to worry about the human presence but the bird of prey was disturbed three times in half an hour by dogs. It hovered and dived beneath the bush line once, but it was not seen to make a successful strike. 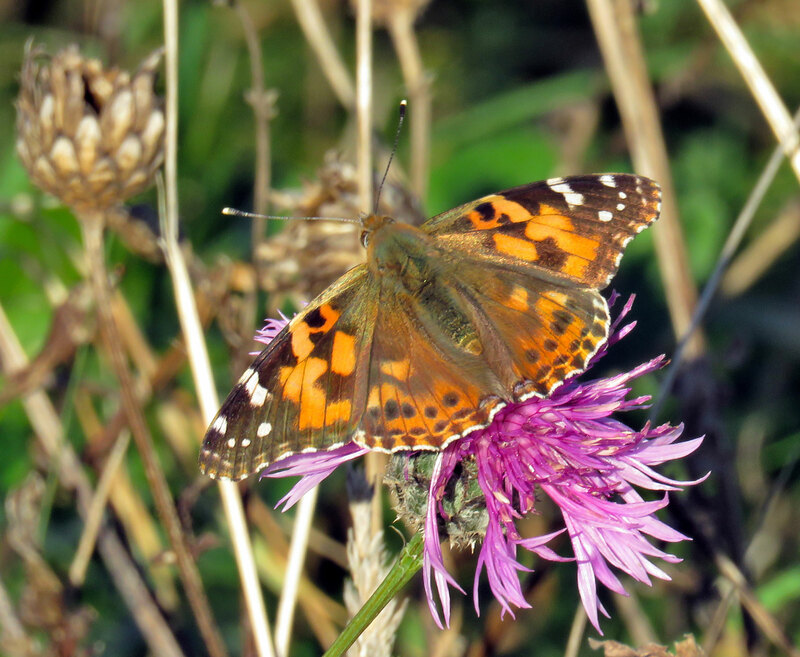 A Painted Lady Butterfly visited one of the occasional remaining Greater Knapweed flowers near the upper car park on Mill Hill. 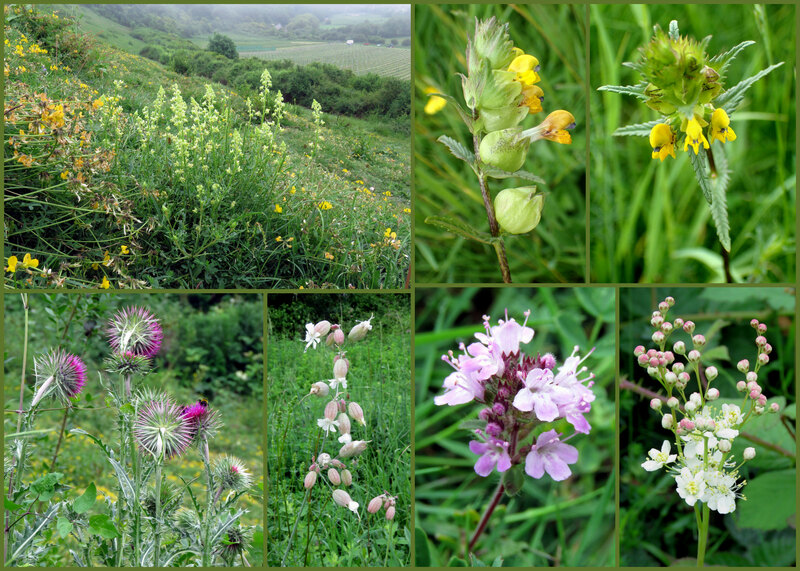 There were still frequent flowers on the top and middle of Mill Hill but most species were widespread and occasional. Dogweed leaves were turning the edge of the scrub a dark red maroon colour. This was in addition to the red berries (=haws) of the Hawthorn. It was just too good to stay at my desk and so headed to Mill Hill. Under clear blue sky and light wind, it wasn’t long before I had my first, albeit brief, sighting of a fresh female Common Blue as I was walking down the steps towards the lower slope. By the time I reached the northern end I had 6 male Clouded Yellow under my belt. In the bottom corner were numerous mix of male and female Common Blue, most in various states of ‘worn’ but one male stood out as a minter. 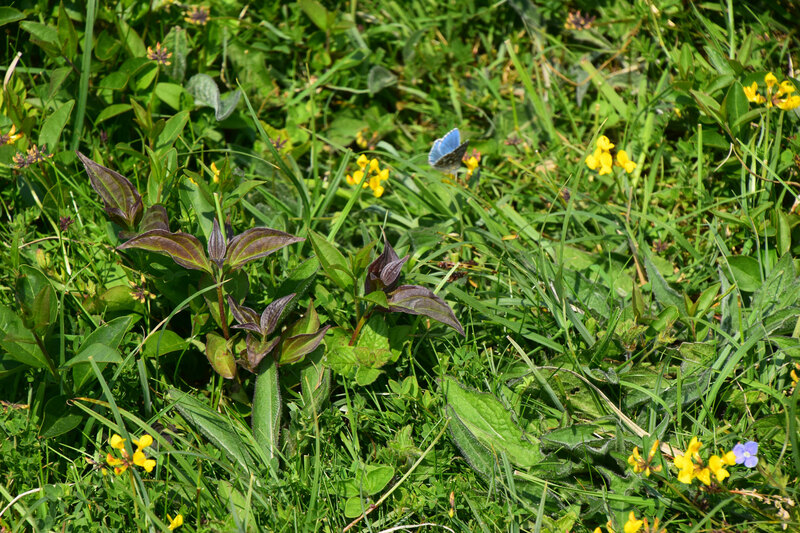 On my return I spotted what I initially thought was a Common Blue pairing when who should show up but Vince. He and I spent the best part of an hour discussing this very late phenomena for a Common Blue pairing when we suddenly noticed the possibility that one of them could actually be a Brown Argus (you’ll see what we mean in the photos as the tell tale figure eight is very indistinct on the male). 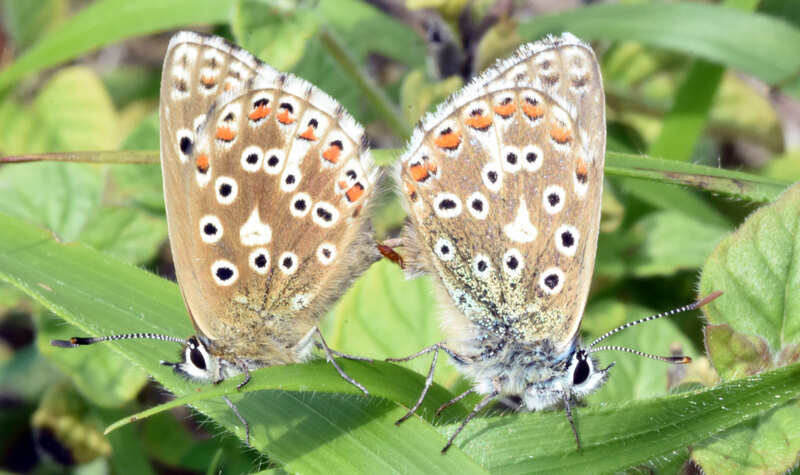 The pair then rotated 180° so we got a good view of both sides and realised they they were in fact both Brown Argus. 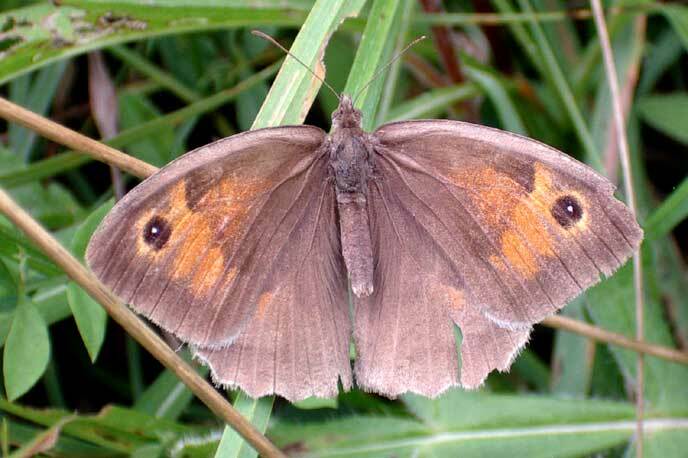 A very fresh Meadow Brown was also seen along with a very large Small White and a Red Admiral. 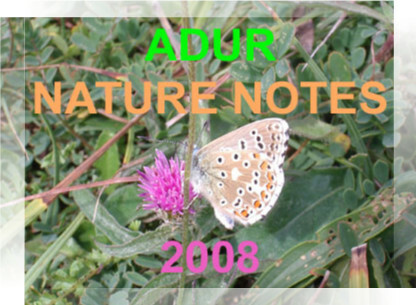 These were the first two local reports of both Brown Argus and Small White in the month of November. 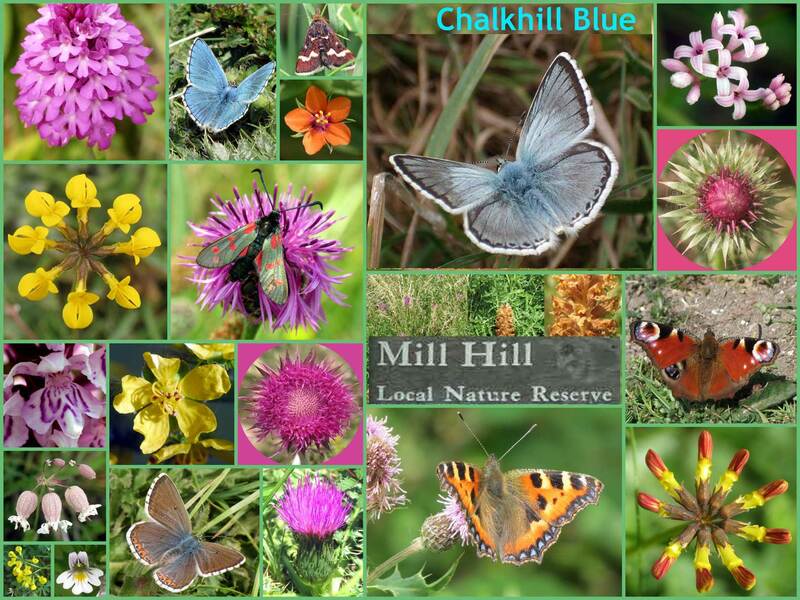 There was a chill on the northerly breeze in the afternoon and no butterflies were seen on the upper part of Mill Hill. I noted a few Common Darters (a small dragonfly). As the afternoon wore on, the sun came out under a clear blue sky, which prompted an unplanned visit to the top part of MiIl Hill . The new growths of Hemp Agrimony attracted five Red Admirals on the middle gentle slopes of MiIl Hill near the Copse. I made a passage journey twice over the top plateau without seeing any butterflies. Crane-flies were very frequently seen with an occasional Common Darters (a small dragonfly). 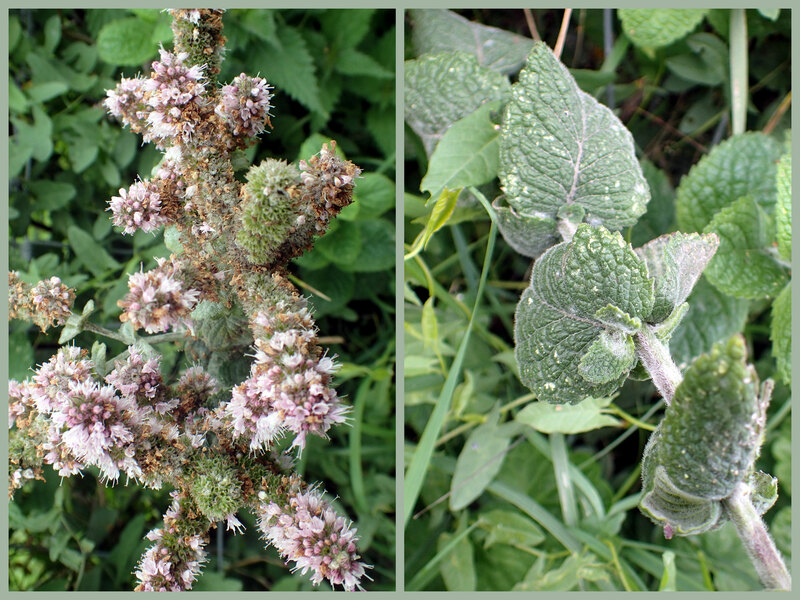 There was a smattering of flowers, most noticeably the Hemp Agrimony with new flowers of Marjoram next to it. The usual late flowers were noted: Rough Hawkbit was widespread, Lesser Hawkbit was checked out in one patch, Small Scabious was in flower on the plateau, Dogwood shrub on the scrub edges, frequent Hoary Ragwort, remnants of Wild Basil, occasional Hardheads and a few Greater Knapweeds, with a few more species lingering on. Under a hazy blue sky, the new growths of Hemp Agrimony attracted the vanessidbutterflies on the middle gentle slopes of MiIl Hill near the Copse. 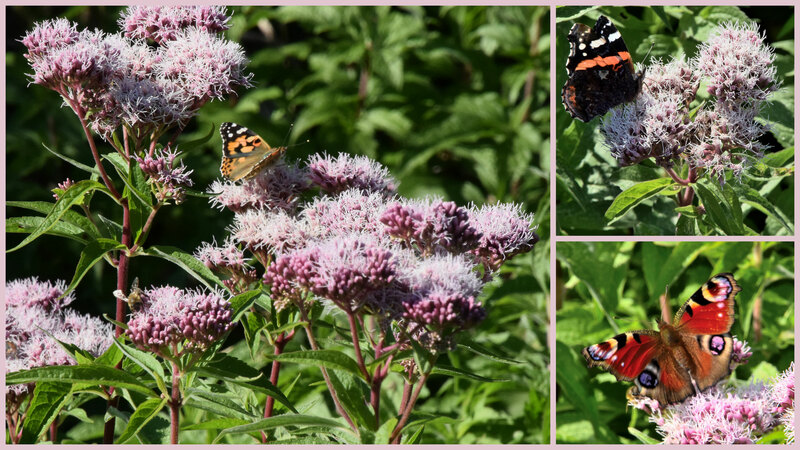 These were Red Admirals, Peacocks and a Painted Lady Butterfly. Other butterflies seen on the top part of MiIl Hill included occasional widespread Small Heaths, occasional Common Blues localised to the Marjoram meadows, one Meadow Brown on the plateau, one Wall Brown which was the only butterfly seen in the top meadow, and a Large White. Crane-flies were frequently seen as well as few Common Darters (a small dragonfly). A handful of Swallows were seen flying to and fro over the top part of Mill Hill under a clear blue sky. 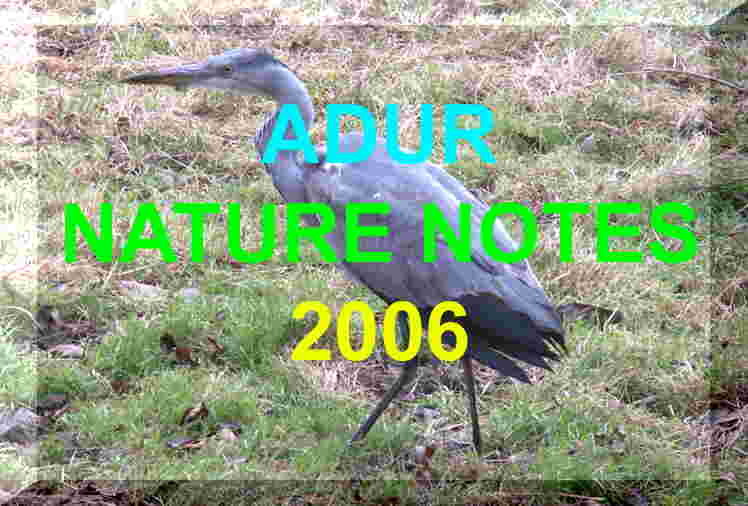 They seen near the bridge (over the A27) and houses, prior to migration south. 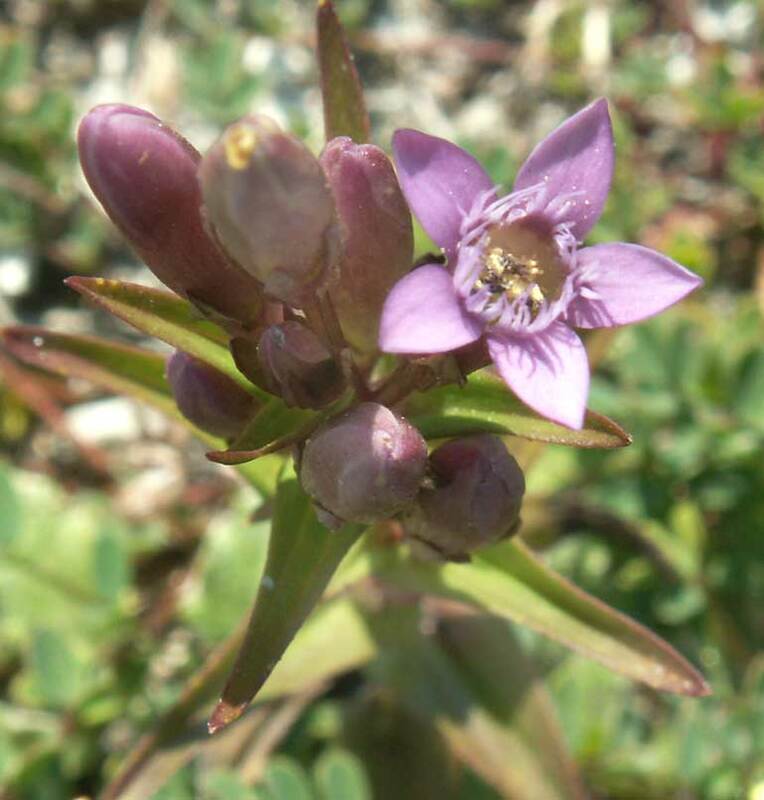 Autumn Gentian was not nearly a prevalent in peak years on the short turf plateau. Some had finished, occasional clumps flowering, and frequent clumps budding. I spotted a single Harebell. 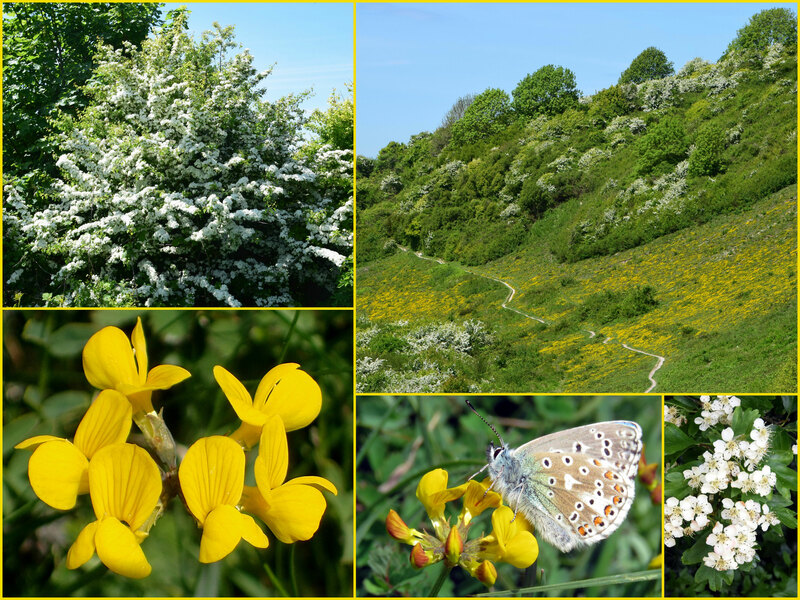 The butterflies were not to be seen on flowers apart from one female Common Blue which visited Greater Bird's Foot Trefoil, Hoary Ragwort, Melilot and a budding Dogwood. 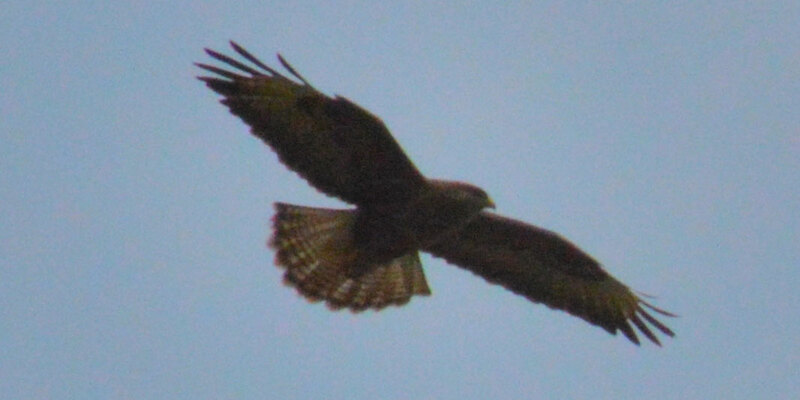 There was the usual Kestrel over Mill Hill, but that hardly warrants a mention. Nine species of butterfly including 25 Adonis Blues that were disturbed in the afternoon on a blustery day under a cloudy sky over the downs. This was nine blue males and sixteen brown females, which all had to be disturbed as they were not actively fluttering around, although one or two visited nectar flowers after they took flight. The frequent 18+ Small Heaths were more lively. Frequent 12+ Meadow Browns were not so lively. There were at least four Common Blues at the far northern end of the lower slopes. Large White Butterflies fluttered about. I spotted a resting Treble-bar Moth and I disturbed a few faded to brown, pyralid micro-moths Pyrausta purpuralis. 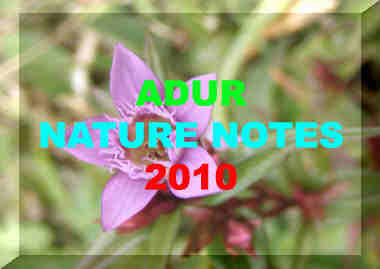 On the lower slopes the visited and available nectar plants included diminutive scattered Hardheads on frequent occasions and virtually the only flowers visited, a Small Heath visiting the tiny Squinancywort, an Adonis Blue on a Autumn Gentianthat seemed to have ceased flowering, but no butterflies on the Carline Thistle or Devil's Bit Scabious. Immigrant butterfliesincluded a couple of restless Clouded Yellows over the lower slopes and a faded Painted Lady near the upper car park. There were was a Speckled Wood near the top Copse. There were also three Speckled Woods at the top of Chanctonbury Drive and a probable Holly Blue. A dragonfly hawked over the top of Mill Hill near the water trough. I was unable to discern to species, but I'd first guess it to be a Southern Hawker. I could not rule out a Migrant Hawker? 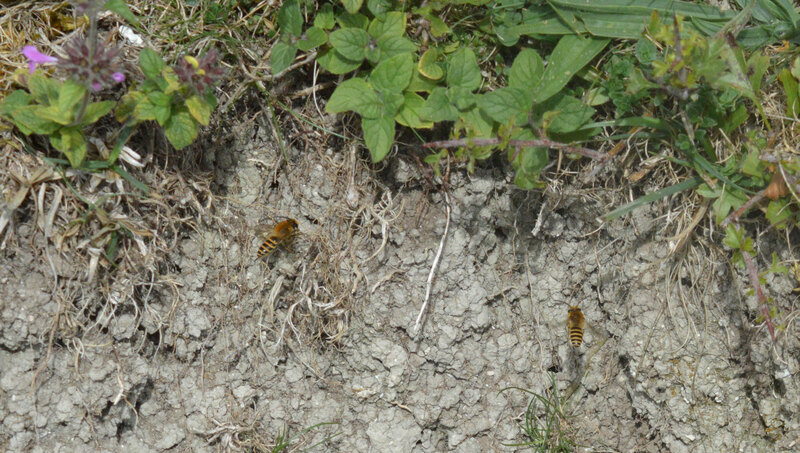 Again this year, there were the colonies of Ivy Bees using bare earth ramparts on the lower slopes. In the weak sunshine with clouds I visited the lower slopes of Mill Hill where there was over forty Adonis Blue Butterflies with about one third females, frequent Small Heaths and frequent Meadow Browns, a few, mostly worn, Chalkhill Blues, occasional Common Blues, a few Large Whites, one Green-veined White, one Clouded Yellow, occasional 7+ Treble-bar Moths, and frequent, faded to brown, pyralid micro-moths Pyrausta purpuralis. 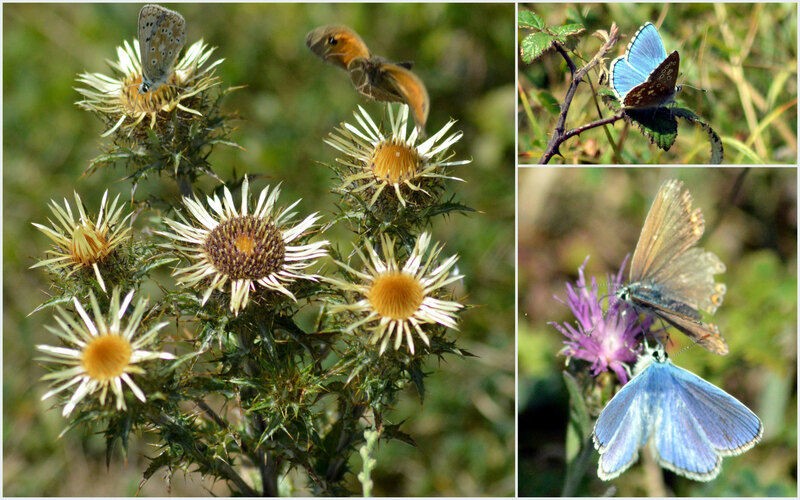 Three mating pairs of blue butterflies were observed. Two pairs were definitely Adonis Blues and probably the first pair as well. 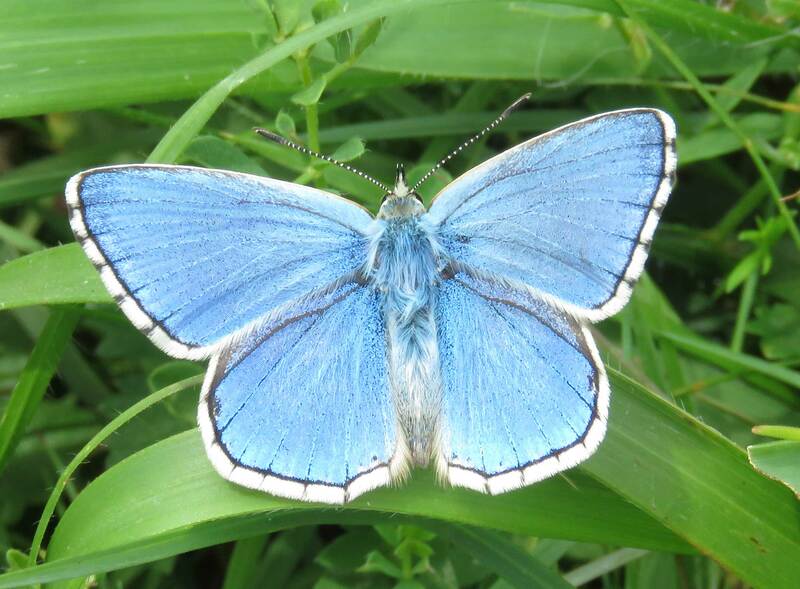 Most of the male Adonis Blues were worn and many were tattered and some had lost their blue sheen. 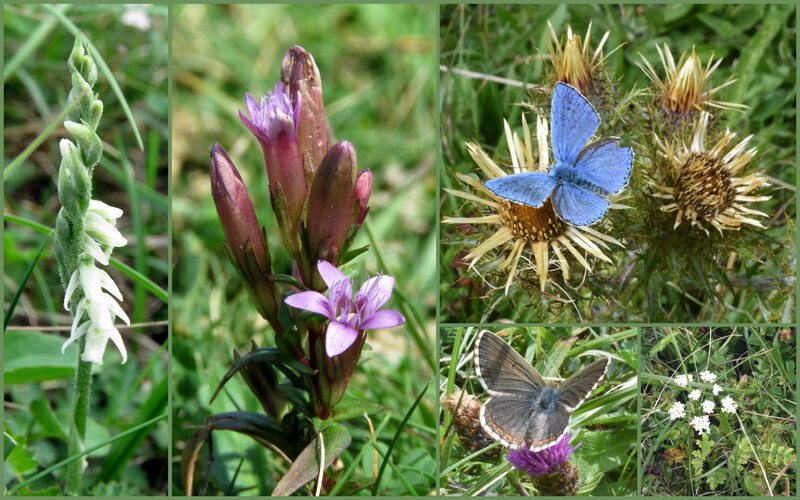 The scattered Bird's Foot Trefoil was almost the only flower visited by the Adonis Blues. A spike of Autumn Lady's Tresses was spotted on the lower slopes. 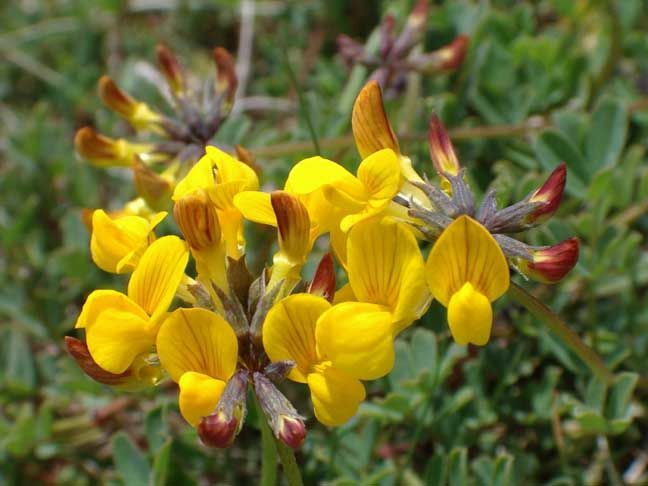 The herbicide sprayed is Grazon which specifically kills legumes like Horseshoe Vetch, Hippocrepis comosa, which could explain the very large patches where the essential herb is absent. 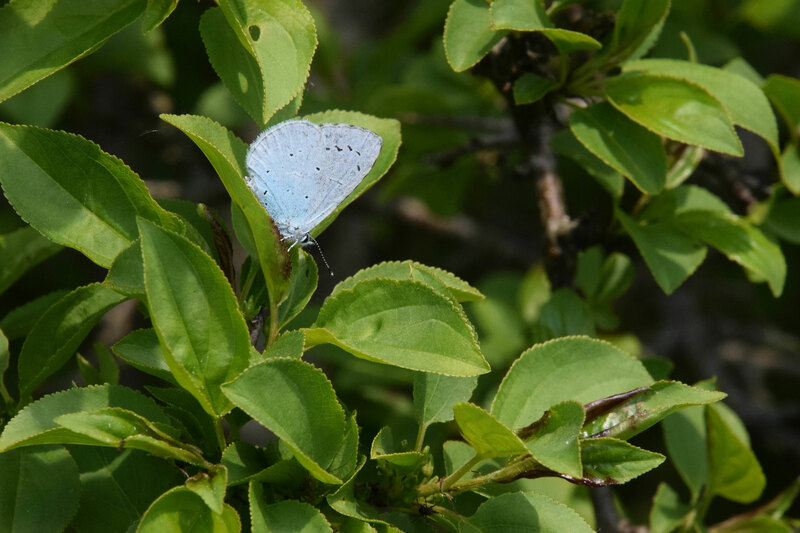 The blue butterflies require the herb as their only caterpillar feeding plant. The large absences can be clearly seen on the ground (and compared to photographs from 2006). 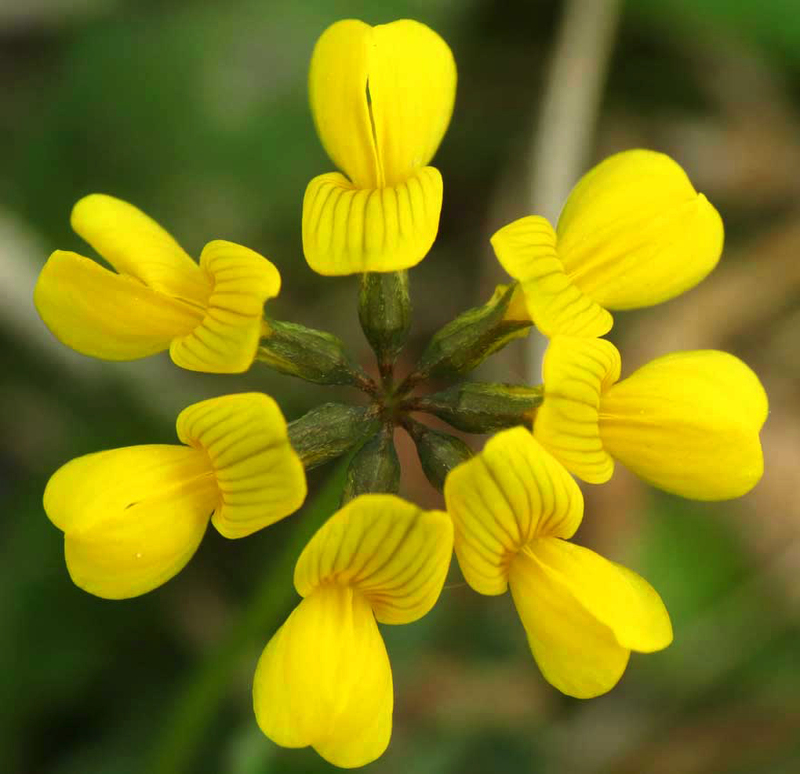 Horseshoe Vetch has a very low recolonisation rate and it will take decades to recover. On the eastern road verge opposite the lower car park, a single White Campion was flowering. By the fence between the car park and the horse's field there was a few plants of Applemint, Mentha x rotundifolia Bowles Variety. Applemint is unlikely to set many seedlings but plentiful suckers from the roots. This plant has been both wrongly named and wrongly identified in the past and the correct name may be Mentha x villosa also known as Applemint. Because of my relative failure of my photography the previous day, I visited the top plateau of Mill Hill and I spent well over an hour there in the early afternoon, mostly because I had difficulty in finding the spikes of Autumn Lady's Tresses (an orchid). When the sun was out from behind the clouds, so were the butterflies and many more than expected. 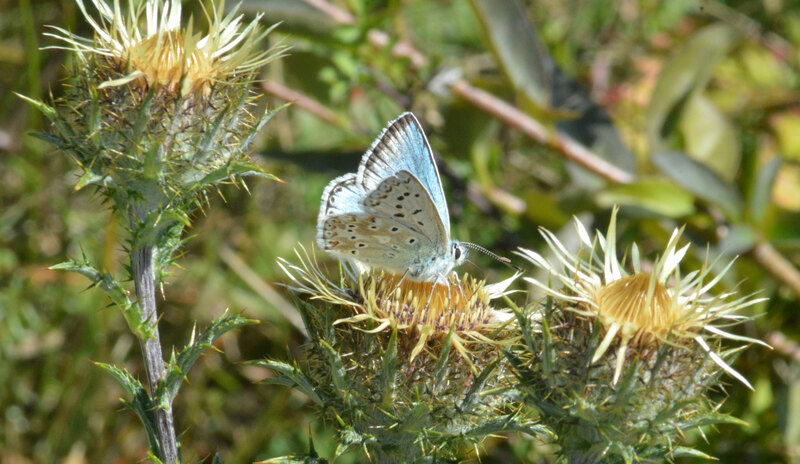 An estimated 40 Adonis Blues, including a count of 16 females, were everywhere on the one acre upper plateau but were only active when it was sunny. They were exceeded in number by an estimated 50+ Small Heaths, joined by a dozen Meadow Browns, a few Small Whites and at least two Common Blues. 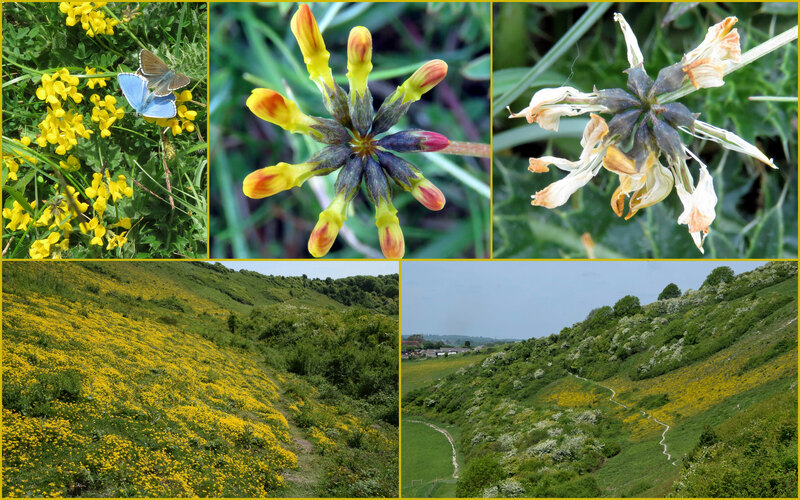 Nectar flowers were well spaced out and the Adonis Blues were seen visiting Bird's Foot Trefoil, Rough Hawkbit, Hardheads and Carline Thistle as expected, as well as Squinancywort, Eyebright, and the rarely visited Hoary Plantain and Round-headed Rampion. The first flowers of Autumn Gentian appeared. Two micro-moths were frequently seen: the Common Grass-veneer, Agriphila tristella (probably) or Agriphila selasella, and the pyralid Pyrausta despicata. Grasshoppers were frequently disturbed, most of them identified as green specimens of the Meadow Grasshopper, Chorthippus parallelus. Cloudy* and overcast and too dull for the butterflies to be active, the top plateau on Mill Hill had the first budding Autumn Gentian, frequent very small spikes of Autumn Lady's Tresses (an orchid), scattered Squinancywort and other expected flowers like small Rough Hawkbits, Small Scabious, occasional Round-headed Rampion and Hoary Ragwort. I did stumble over a male Adonis Blue Butterfly and a few Meadow Browns on the top plateau, and a few Common Blues and a Small Heath in the meadow north of the upper car park where a predatory sawfly Tenthredo species was spotted in the afternoon. More Common Toadflax was a surprise in this meadow where these were just occasional colours of remaining flowers. The dark red berries of Hawthorn produced the most colour with the inevitable Blackberries and the occasional sloe berry of Blackthorn. A cursory visit to the middle slopes produced nothing noteworthy. However, I did make a note that fresh plants of Hemp Agrimony appeared vigorously where it previous it had been cleared, and a flowering White Campion. Cloudy and breezy with a hint of rain on the top and middle slope meadows of Mill Hill where Small Heath Butterflies (20+) were disturbed with Common Blues (15+), Meadow Browns (20+) both mainly females, male Adonis Blues (15+) and a few Small White Butterflies. Two pyralid micro-moths Pyrausta purpuralis showed. The first two spikes of Autumn Lady's Tresses were seen at the southern end of the top plateau where they are usually found, with Round-headed Rampion and Small Scabious in flower. A single plant of Common Toadflax was seen amongst the Marjoram on the middle slopes. 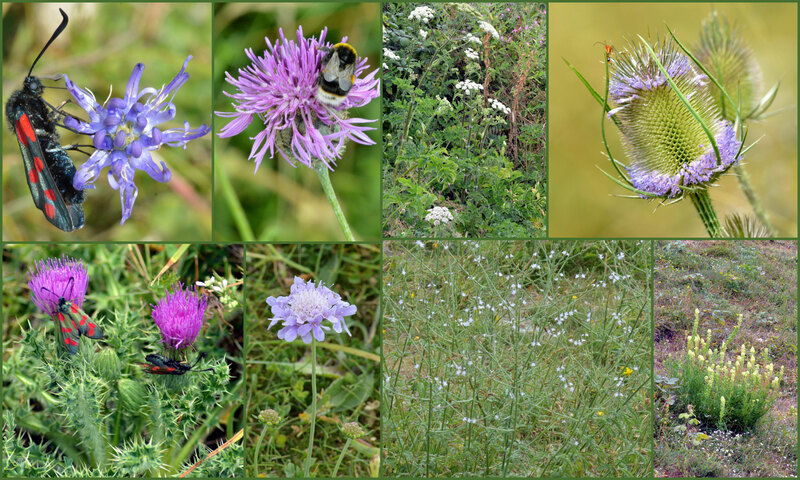 The blue butterflies and Meadow Browns were attracted to Carline Thistle but also visited Dwarf Thistle and miniature Hardheads, and a Chalkhill Blue made one visit to the first Devil's Bit Scabious of the year and a Ploughman's Spikenard. A Kestrel hovered over the ridge and made two vertical dives down to the ground, but, again, I did not see any prey in its talons as it resumed hovering. An early afternoon truncated visit to the lower slopes off Mill Hill was just too uncomfortable with the excessive warmth and drenching humidity. In a one third of an acre transect, I counted 133+ lively male Adonis Blues, an estimated 30+ Chalkhill Blues including five brown females, 25+ Common Blues, 60+ Meadow Browns 15+ Gatekeepers 15+ Small Heaths, occasional Small Whites, four restless Clouded Yellows, two Wall Browns, a few Speckled Woods (over the southern steps) and a Treble-bar Moth. At one stage thirty Adonis Blues surrounded me. On the southern top part of Mill Hill, there were occasionally more Chalkhill Blues, Meadow Browns and a pyralid micro-moth: a Pyrausta despicata. A Wasp Spider was an unusual discovery on Mill Hill. It had wrapped up its prey in its web. I cycled up to Mill Hill about midday for the annual count of Chalkhill Blues on the fixed one acre transect on the lower slopes. The 30 minute count recorded 51 male Chalkhill Blues. This was a very low day count but not the worst recorded which was 30 in2016. They were even outnumbered by male Adonis Blues which were counted at 58. There were about the same number of Meadow Browns (estimated 50+), frequent Common Blues (20+), Gatekeepers (15+), Small Heaths (15+) a few Small Whites and a solitary Marbled White on the lower slopes transect. 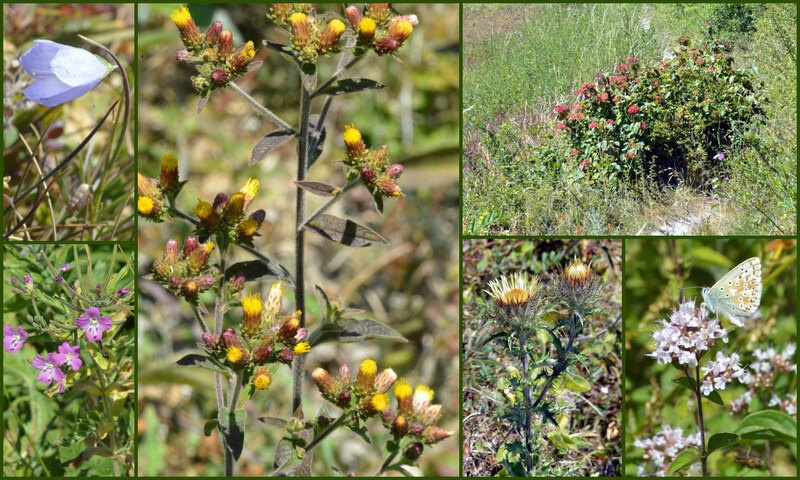 Carline Thistle was the best flower attractive to the butterflies as the parched slopes. A Treble-bar Moth landed and I remember noting the bright colours of a pristine Purple Pyrausta MIcro-moth Pyrausta purpuralis. Only after completing the transect, I found a female Chalkhill Blue very slowly crawling over some Horseshoe Vetch leaves. I only visited the lower slopes, returning by the winding path where I met a Speckled Wood over the southern steps. There is a Buddleia tree by the lower car park and this hosted a fresh Painted Lady, a tattered Comma Butterfly and a Red Admiral. Pineapple Weed was seen for the first time by the southern car park. 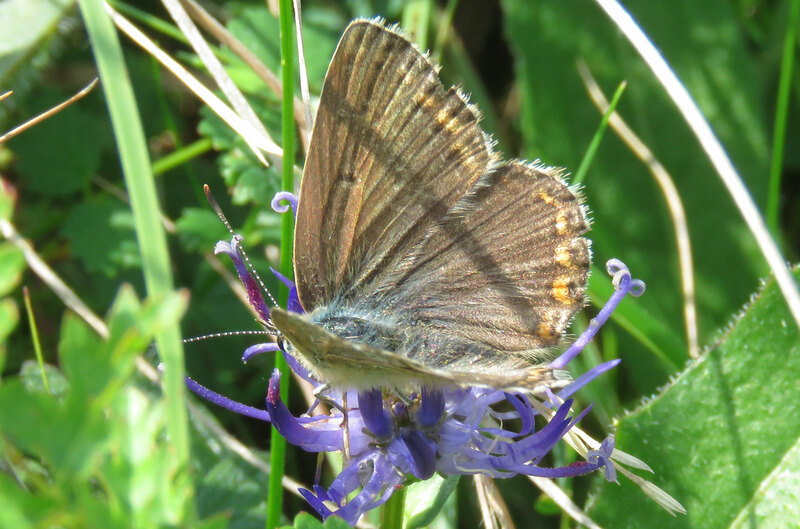 On the turn of the month, the Chalkhill Blues were expected to reach peak numbers on the lower slopes of Mill Hill, but for the fifteenth successive year the numbers have been terribly disappointing. Under a cloudy sky, a third of an acre transect at the northern end of the lower slopes recorded 26 (including two females) and were nearly usurped by 24 male Adonis Blues and frequent Common Blues. I did manage to spot my first two Clouded Yellows of the year. Then the sun came out briefly and suddenly I was surrounded by 25 more Chalkhill Blues and a few extra Adonis Blues as well. This made it difficult to arrive at a count which must have been fifty or more. It was still a disappointing tally. Two females were spotted with one crawling over Horseshoe Vetch leaves before laying her eggs. Meadow Browns (350+) were common and ubiquitous all over Mill Hill, with very frequent Small Heaths and Gatekeepers, Speckled Woods in the shade, a few Small Whites, a surprise Marbled White from a patch of long grass on the lower slopes, a Wall Brown on a path near the copse, hundreds of Common Blues in the meadows with a few Brown Argus, a Painted Lady south of the Reservoir. 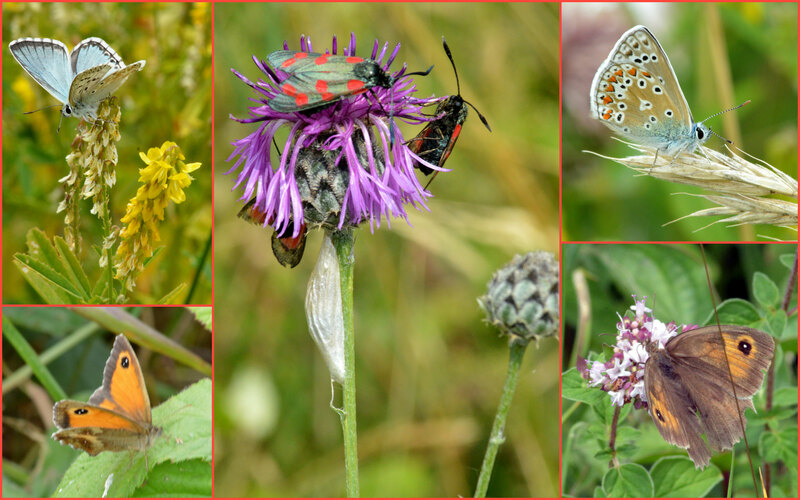 On passage through the middle slopes I noted a 6-spotted Burnet Moth, and Silver Y Moths amongst the denser vegetation especially Knapweeds foliage, with a Treble-bar Moth on the lower slopes. It felt cool in the late afternoon when I made an unplanned visit to the upper part of Mill Hill under a cloudy sky. The breeze spoilt many photographs as long grasses were blown into the frame blurring the image. Butterflies were easily disturbed on the plateau with seven male Chalkhill Blues and a Red Admiral. 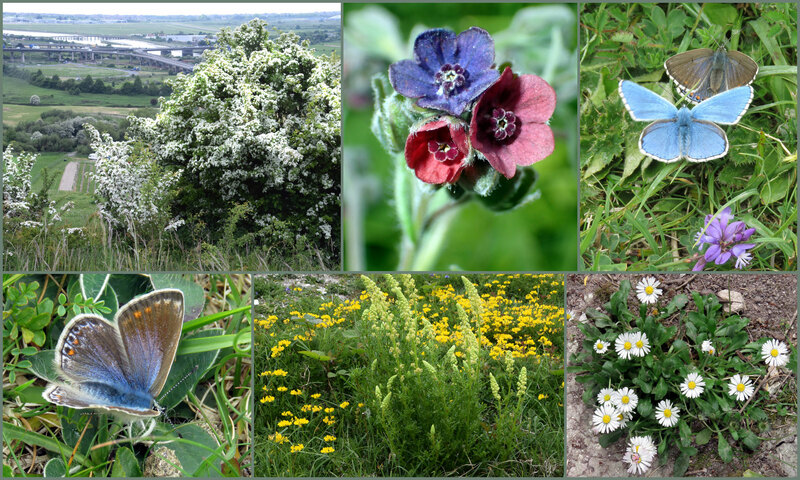 In the top meadow, Common Blues were frequently sent into flight with my footfall, with frequent Brown Argus, Meadow Browns and Silver Y Moths, a Painted Lady and a Wall Brown. A very quick detour to the middle patch of Mill Hill added a resting Small Heath and Gatekeepers. Already too warm by 11:00 am, the butterflies were all very active on Mill Hill. Ubiquitous and common, Meadow Browns (200+) were in the meadows, middle slopes, scrub and lower slopes with plenty of large females. 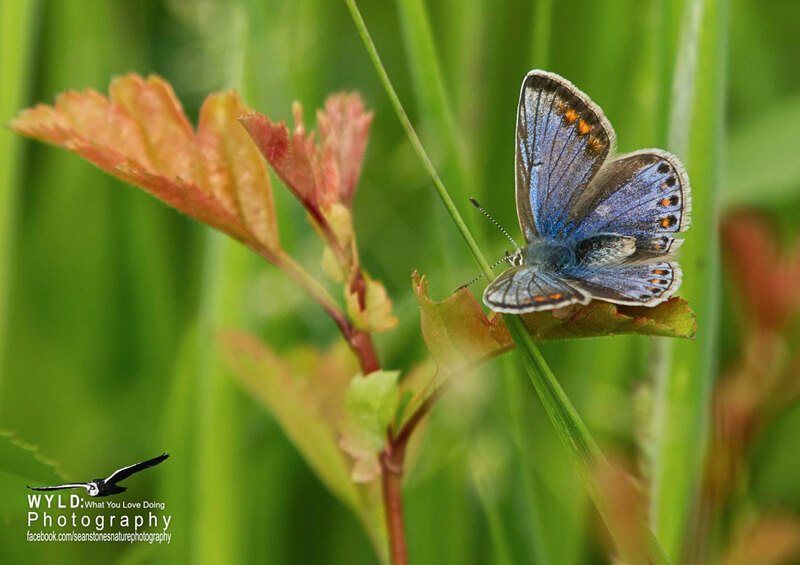 Common Blues (100+) had a similar widespread appearance with most in the taller meadow habitat with Brown Argus. 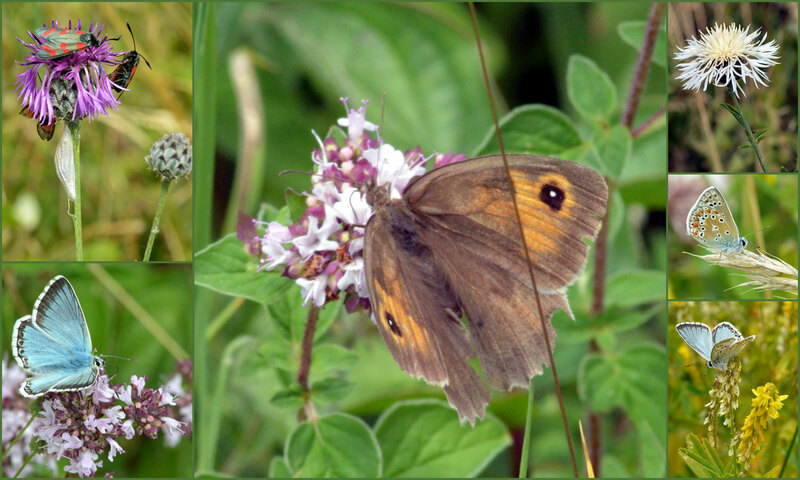 Gatekeepers (30+) will only found in the hedgerows, scrub and visiting Marjoram. Chalkhill Blue Butterflies were more widespread than expected with 16 counted on the top and middle of Mill Hill and a very disappointing 31 males on the parched lower slopes on the half acre transect. There seemed to be a new emergence and an a impressive display of Small Heaths (50+) in both the meadows and more open slopes. Other butterflies in frequent numbers were Large (or Small?) Whites everywhere is small numbers (12+), a dozen energetic male Adonis Blues on the lower slopes, and about the same number of Speckled Woods in the shade of the scrub and copse. A Silver-spotted Skipper attracted my attention landing on an isolated flowering Hardhead on the northern middle slopes. It was very obliging for a photograph as well. Not so obliging was a restless Wall Brown on the middle slopes above the ridge path, where a Treble-bar Moth landed and I found just one 6-spotted Burnet Moth. Buddleia was flowering on bushes scattered over Mill Hill. Meadow Browns were the main visitors accompanied by a handful of the more colourful Painted Ladies, a few Red Admirals and a Peacock Butterfly. A Kestrel hovered over the middle slopes and swooped down to the ground suddenly, but I did not see any prey in its talons. 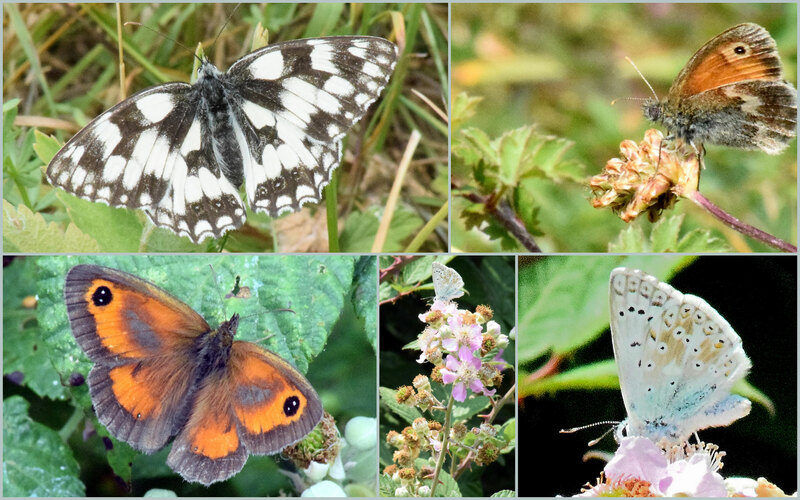 With the humid warm weather approaching a health risk, perhaps a visit to Mill Hill was ill advised, but I wanted to check up on the number of butterflies in the afternoon on the parched downs. 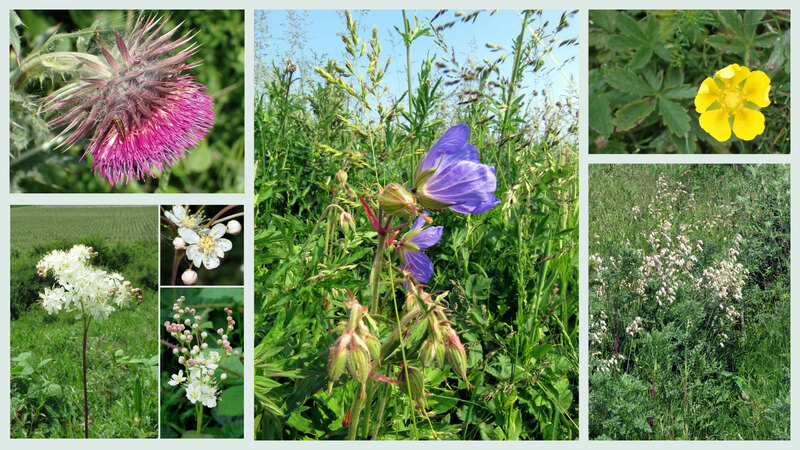 Meadow Browns and Chalkhill Blue Butterflies were seen on the long grass verges as I cycled up to the upper car park. Leaving the car park compound by the north gate, I was immediately greeted by a dozen butterflies of four species, very lively in the sunshine. I did not know where to point my camera! Chalkhill Blues were too lively as were Common Blues and Meadow Browns and the four Painted Ladies were continually moving but a larger target. 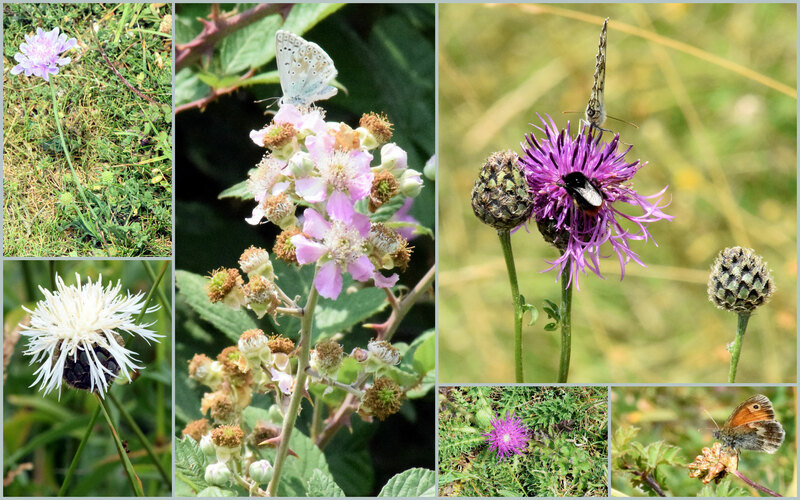 The meadow north of the upper car park was full of literally hundreds of butterflies, the nature of the tall and dense vegetation made an estimate of a mostly Common Blues and Meadow Browns beyond my attempt. 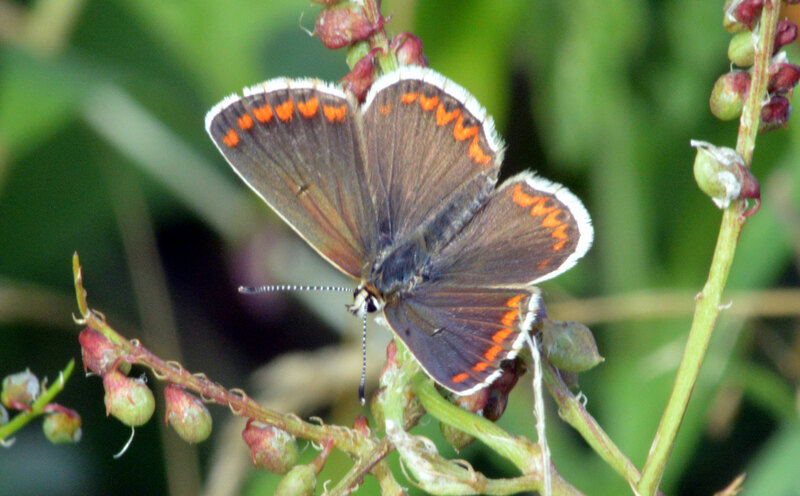 A dozen male Chalkhill Blues were seen as the butterflies chased each other around and I managed to spot a Brown Argus. Under the shade of the copse and in the scrub, Speckled Woods were frequently seen. The first of frequent Large Whites, Gatekeepers (20+), Small Heaths were seen in the open Marjoram patches of the middle slopes with many more Meadow Browns (100+) and Chalkhill Blue Butterflies (20+). A Comma Butterfly and a Peacock Butterfly were seen on Buddleia. 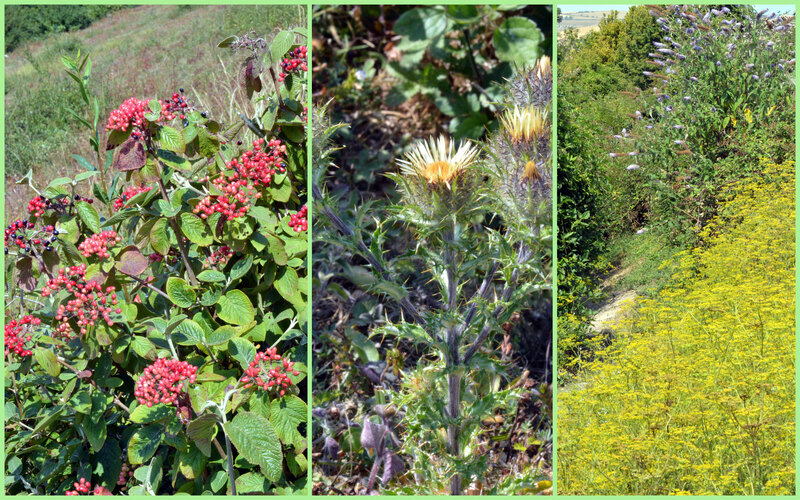 On the middle and lower slopes, the green shoots of Carline Thistle appeared with a few budding flowers. 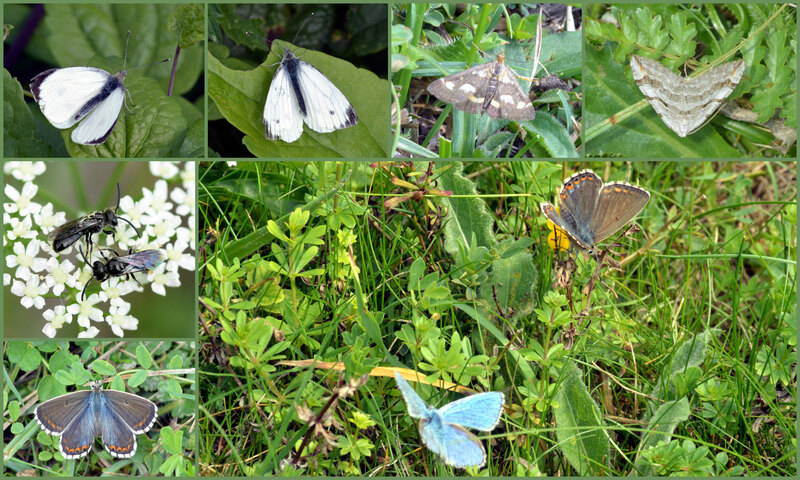 Almost all the whites were Large Whites but I identified two Small Whites. A faded Mint Moth was spotted on Marjoram. A Treble-bar Moth landed. 6-spotted Burnet Moths were down in numbers but still frequently seen. 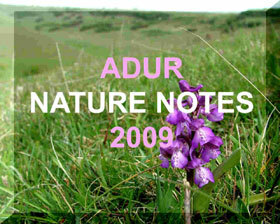 A single Harebell flower was spotted on the short turf at the top of the hill. 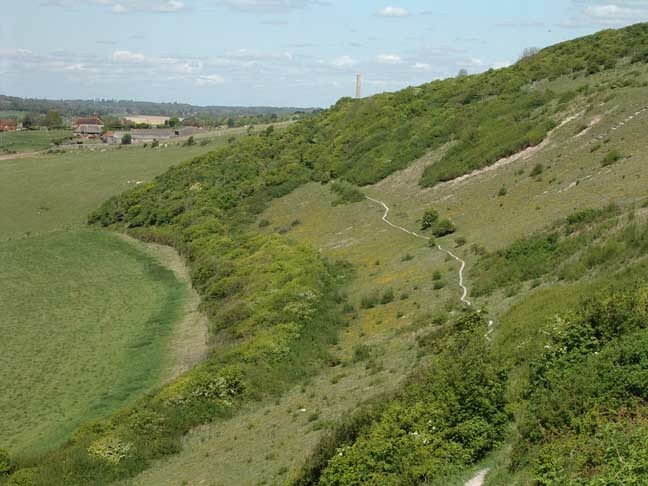 Generally, the downs looked parched and this was much more noticeable on the lower slopes and even the butterflies seem to think so as it was not as crowded as the upper meadow. I was surprised to see a handful of the first second brood Adonis Blues which spent all their time in agonistic conflicts with 20+ Chalkhill Blues and 15+ Common Blues. The first of the female Chalkhill Blues were seen but I did not manage a good look a them before they were chased away. It took me a second to recognise a second brood Dingy Skipper. Small Heaths were easy to spot in the short vegetation. Ploughman's Spikenard was beginning to flower. I made a trip to Mill Hill in the afternoon when the Cirrus cloud cover made it a bit cooler. On the middle slopes the cooling breeze blew the flowers about making all types of photography varying from difficult to near impossible. Butterflies were common in varying degrees, Meadow Browns (100+) were ubiquitous but the other butterflies were more specialised in their appearance, frequent Gatekeepers amongst the thorn, occasional Speckled Woods in the scrub with two Peacock Butterflies on Buddleia, and a dozen male Chalkhill Blue Butterflies over the parched lower slopes, with a few Small Heaths. 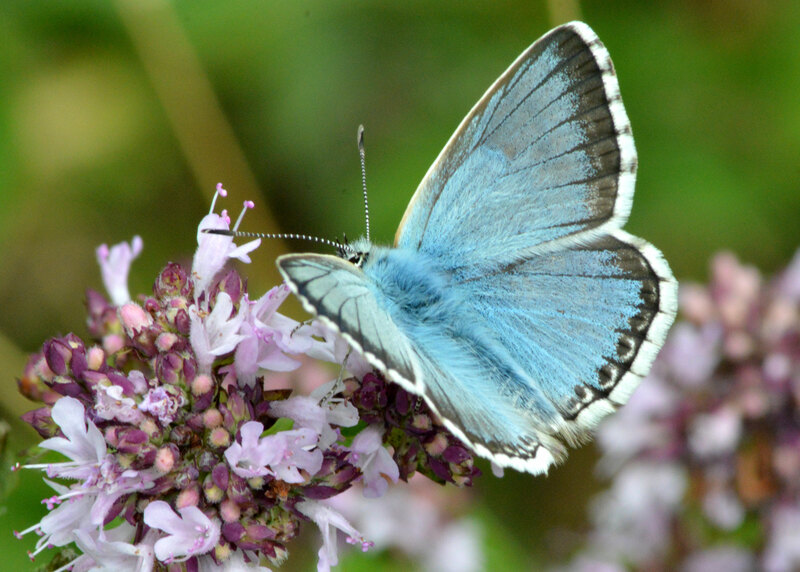 Most butterflies visited the Marjoram patches on the middle slopes, including more Meadow Browns and Gatekeepers, Large Whites, Small Whites, three more Chalkhill Blues and the first of the Common Blues. 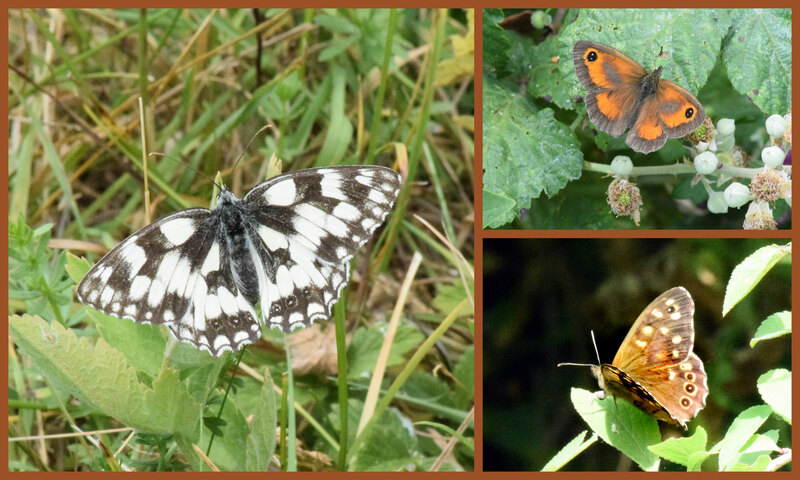 Three Marbled Whites and a Wall Brown and a Brimstone showed very briefly over the lower slopes. The last place on Mill Hill I visited was the meadow to the north of the upper car park which was alive with butterflies: more Meadow Browns and Gatekeepers, frequent Common Blues (20+ seen, more hidden) and a few Brown Argus. 6-spotted Burnet Moths were down in numbers compared to my previous visit with Silver Y Moths frequently seen in the undergrowth. Upright Hedge Parsley, Torilis japonica, (umbellifer) was recognised in some shady areas (it may have been overlooked in previous years). On the top plateau there seemed to be more Small Scabious than I remember before. Under Cirrus clouds, and cooler than before this month at 20.3 °C in the early afternoon, meant the butterflies were not so lively and had to be disturbed, but there was not the energy sapping heat, nor the strong shadows in bright sunshine that can make photography more tricky. On the top meadow of Mill Hill (north of the upper car park) and middle slopes (the Patch to the south of the copse) Meadow Browns (200+) were omnipresent with most hidden, frequent 6-spotted Burnet Moths, and frequent Gatekeepers, shared the top and middle with occasional Chalkhill Blue Butterflies (4+), Common Blues (4+), Large Whites, Small Whites, Green-veined Whites, Small Skippers, a very worn Ringlet and a Peacock Butterfly. I made just a passage journey across the parched lower slopes with Meadow Browns (75+) disturbed just about everywhere, Gatekeepers in the hedgerow-like, white butterflies including three Marbled Whites, but I do not recall actually noting a Small Heath. Over the southern steps there was a pristine Red Admiral and a Speckled Wood. Five separate male Chalkhill Blue Butterflies were disturbed, which meant in each case I nearly trod on them, as the sun was behind the clouds. Burnet Saxifrage was seen in flower on the middle slopes. 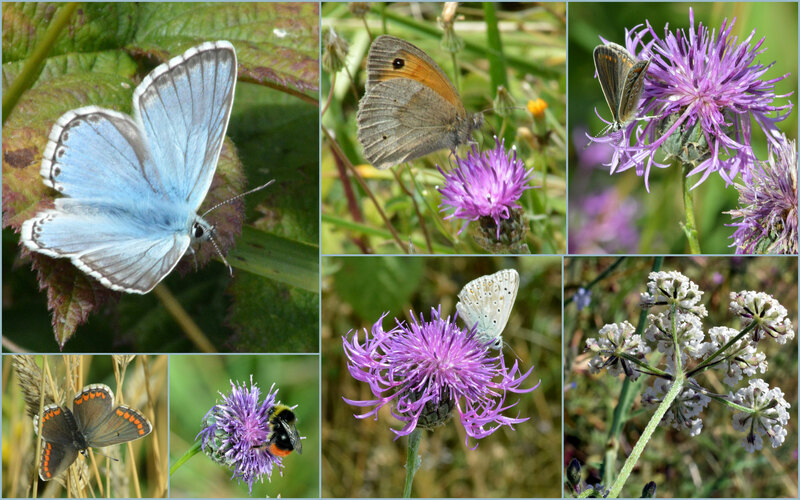 Over the lower slopes of Mill Hill, the flash of pale blue were the very active and restless male Chalkhill Blue Butterflies, and I could not be sure how many there were, anything from three seen simultaneously quarrelling with a Marbled White and other butterflies, to fifteen separate sightings? The snag was they were so restless that I could have counted the same one twice or more .I'd estimate about eight seen on the lower slopes transect. They were outnumbered by the frequent Meadow Browns, frequent 6-spotted Burnet Moths, and frequent Gatekeepers, and shared the lower slopes with Marbled Whites, Large Whites, Green-veined Whites (some large ones) and a few each of Small Heaths, Small Skippers, Silver Y Moths, and two species of Pyrausta micro-moths. I thought I recognised the bright yellow and flight pattern of a Clouded Yellow Butterfly, but did not get a close look so it could have been a Brimstone? On the southern steps there was a Speckled Wood and a Peacock Butterfly, identical to my previous visit. A large bird hung in the breeze (at Kestrel height) over the ridge in the early afternoon. It was my first thought as a Buzzard. It soared away, downwind south-west, higher in the sky in under a minute. It is tempting to say the Buzzard rose on the thermals (ridge or slope soaring: air currents rising up the side of Mill Hill) after this hot weather. There is an alternative description of using dynamic soaring using gusts of wind? 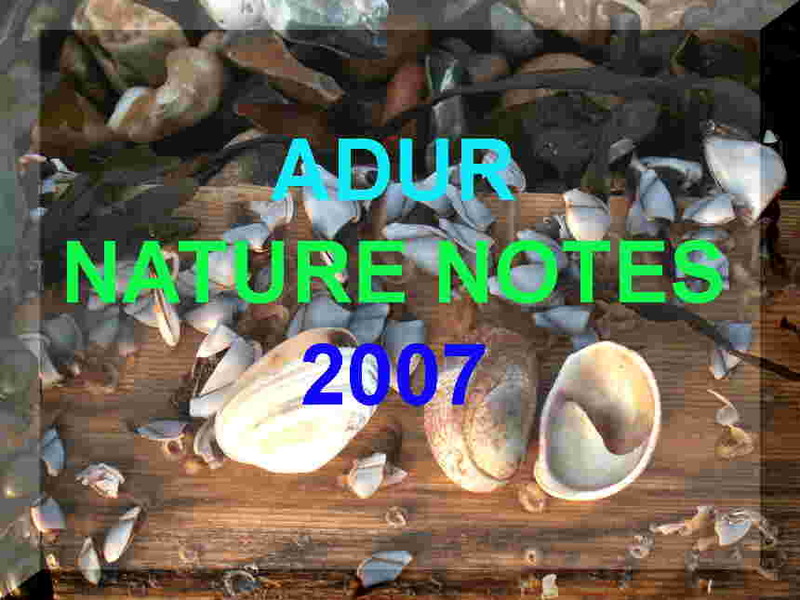 NB:Soar, riding of thermals or updrafts with wings and tail spread and a minimum of wing action. Updraft and downdraft, in meteorology, upward-moving and downward-moving air currents, respectively, that are due to several causes. 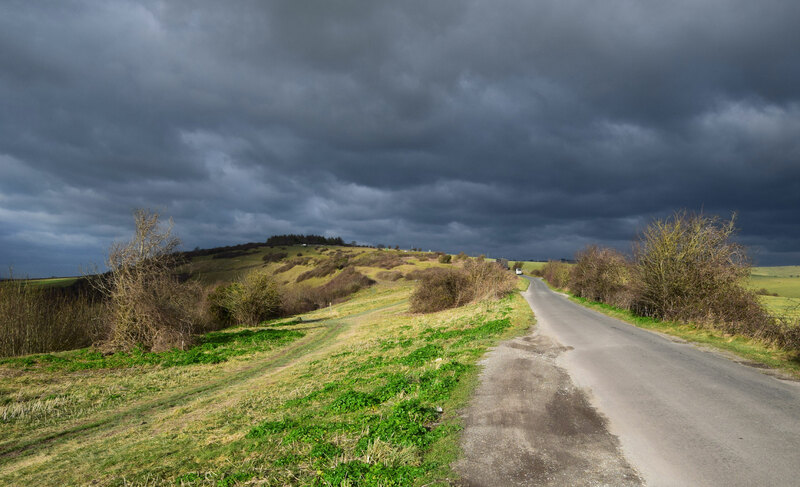 Local daytime heating of the ground causes surface air to become much warmer than the air above, and, because warmer air is less dense, it rises and is replaced by descending cooler air. Ring up, to, to rise in a spiral. 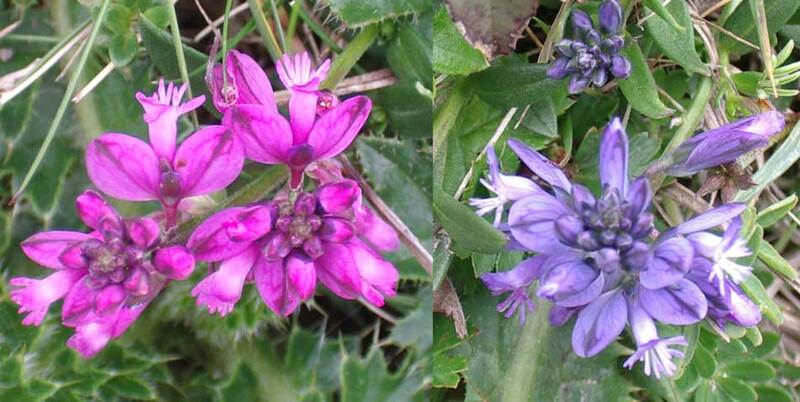 I recorded my first Round-headed Rampion flower of the year near the winding path through the lower slopes of Mill Hill. 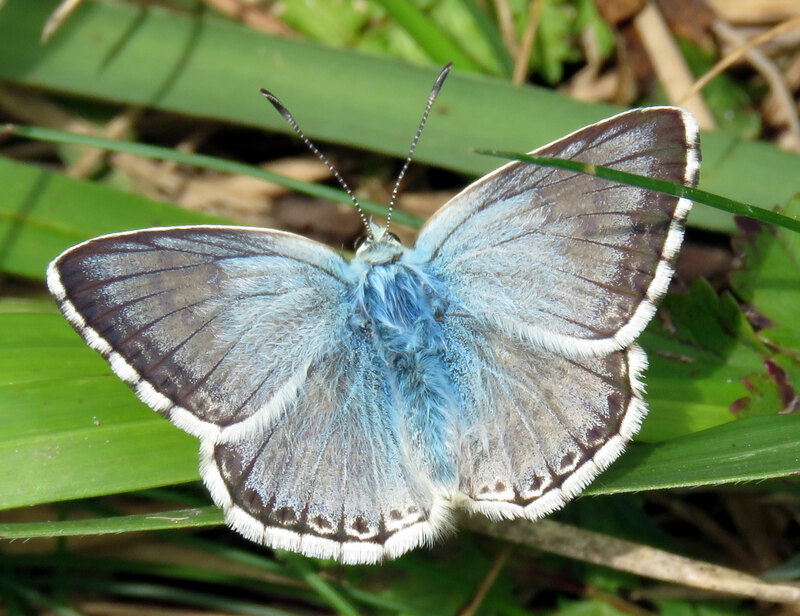 I only visited the lower slopes, retracing my steps, in hope that a Chalkhill Blue would deign to stop and open its wings. Nearly, until another of its own kind chased it from its flower. All the signs of late summer; the meadows had been cut for hay and the young birds were out of their nest and trying to survive on their own. Gatekeepers (butterfly) fluttered around in the hedgerows, where the first Travellers Joy, Clematis, was climbing. 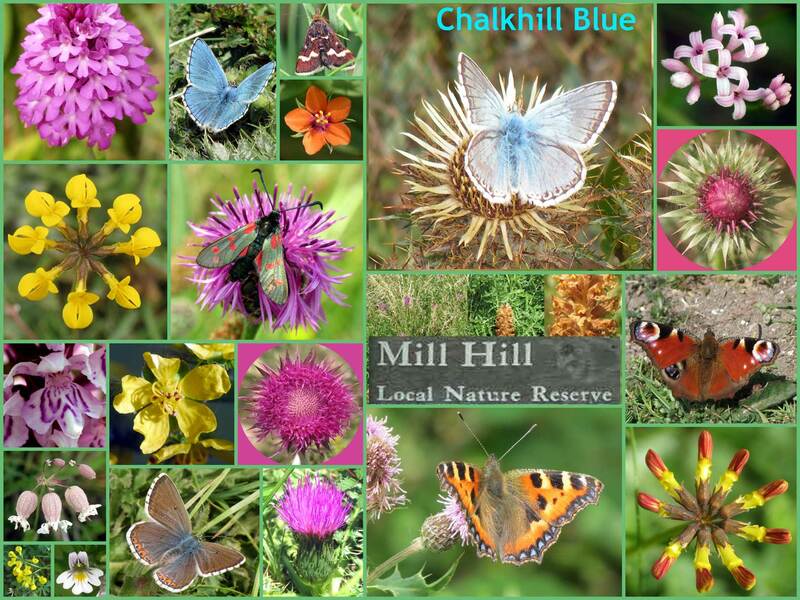 Most of all, the a flash of sky blue and the first male Chalkhill Blue Butterfly emerged on the lower slopes of Mill Hill. Meadow Browns were frequently seen all over Mill Hill, but it was the flashing contrast of frequent Marbled Whites that were most noticeable. A formidable butterfly predator, the Southern Hawker (dragonfly) flew over the southern steps on Mill Hill where in the relative shade under the early afternoon sun, a dark pristine Speckled Wood, (the underwing view of) a fine Peacock Butterfly and a Red Admiral were all disturbed simultaneously. Butterflies were constantly seen on Mill Hill with the total number well over a hundred in under an hour, mostly restless and querulous, the male Common Blue combative with the Chalkhill Blue. A bright yellow Brimstone Butterfly was positively huge when compared the frequent Small Skippers and occasional Small Heaths. Only one at a time Burnet Moths were spotted over the lower slopes. Immigrant Silver Y Moths were occasionally seen almost everywhere like they have been for the last week or more. Likewise the Large White Butterflies. Small Scabious was seen in flower near the path on the lower slopes for the first time this year. A bird descended like a Kestrel, from above the ridge to the steeper slopes, but it looked like a Crow. A very parched Mill Hill was visited in the sunshine of the early afternoon under a clear blue sky on the warmest day of the year recording 26.0 °C in the shade at 3:00 pm by the Met Office (Shoreham). It was breezy (Force 4) on the top of the hill, the long grassesregularly swaying. 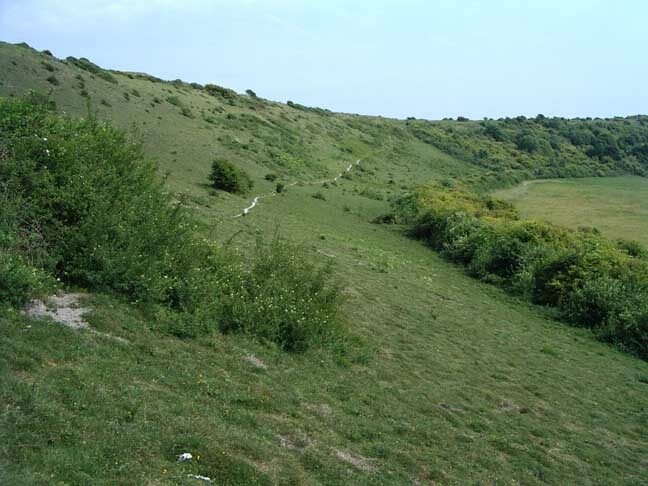 Conditions were far from ideal for a walk under the burning sun and the downs were empty apart from a few dog walkers. Scores of butterflies fluttered around but would not settle on the nectar flowers for the most part. On the top and middle part of the Mill Hill, Meadow Browns (50+) led the way ahead of restless Marbled Whites and frequent Small Heaths with occasional Large Whites. On the middle slopes, three very bright blue fresh butterflies fluttered around the low vegetation. These can only be new male Common Blues. 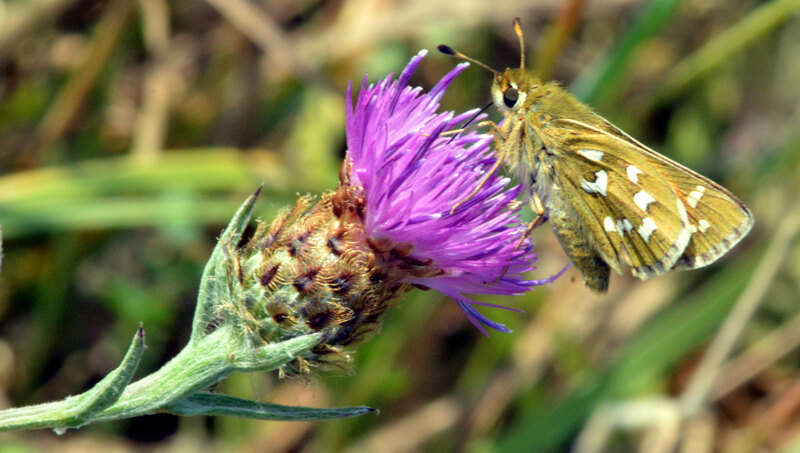 A few Cinnabar Moths were disturbed and a few Silver Y Moths fluttered amongst the dense growths of Greater Knapweed, which was now flowering. My first Gatekeeper of the year was spotted a on the edge of the scrub, and a second one skirting the scrub on the parched lower slopes. On a patch of Burdock on the disturbed land near the cattle trough, I spied my first Small Skipper of the year. Finally, a Comma Butterfly flew next to the road. A small bug on Ox-eye Daisy on the steeper slopes of Mill Hill was my first ever record of Calocoris roseomaculatus. 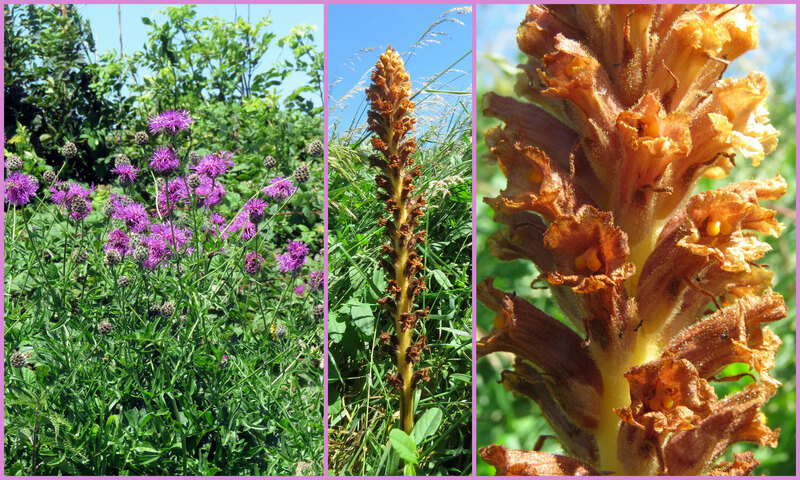 Of the flowers newly in bloom since my last visit, the tall parasitic Knapweed Broomrape was searched for and found south of the covered reservoir near to the top of the steps down to the lower slopes. Musk Thistle and Great Mullein were flowering near the top of the steep slopes, and the prickly leaves and the first flowers of Dwarf Thistle appeared. Of the much smaller plants the first flowers of Vervain and Wild Basil were noted for the first time, with Restharrow where the cattle had been. 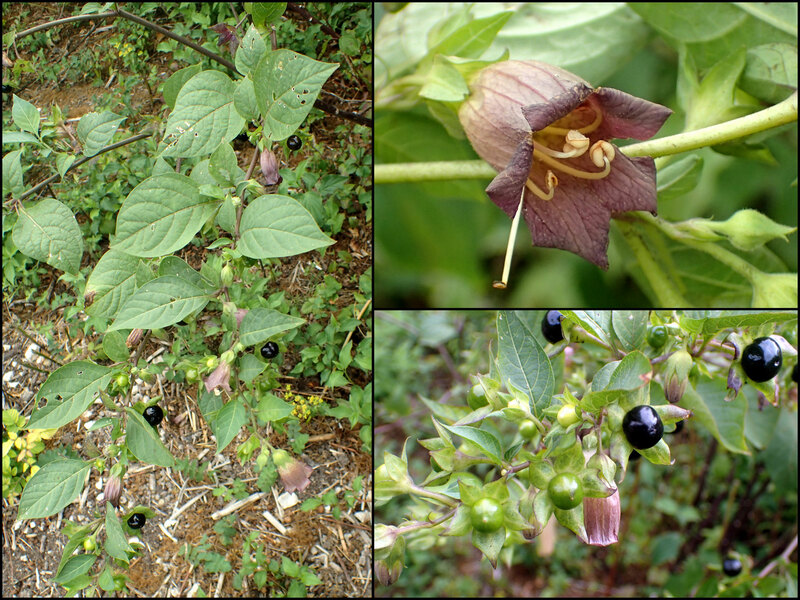 Deadly Nightshade was flowering on the middle slopes where I had not noticed it before, with the green berries (they turn black later) appearing. The diminutive Wild Thyme, Squinancywort and Eyebright were beginning in flower. 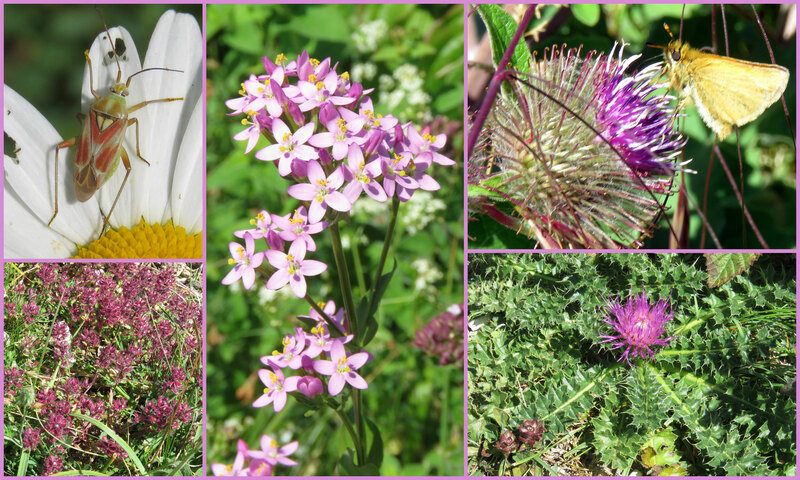 Common Centaury was noticeable and in the meadow north of the upper car park, I spotted my first Field Scabious. Hogweed was already in flower with Greater Willowherb and lots of Mugwort on the cattle disturbed land. There were a few Common Ragwort in flower on the top of the hill, but far less than I remember. Lady's Bedstraw and Hedge Bedstraw were now a flowering component of the top part of Mill Hill. Pyramidal Orchid adorned the middle part where Marjoram was budding. 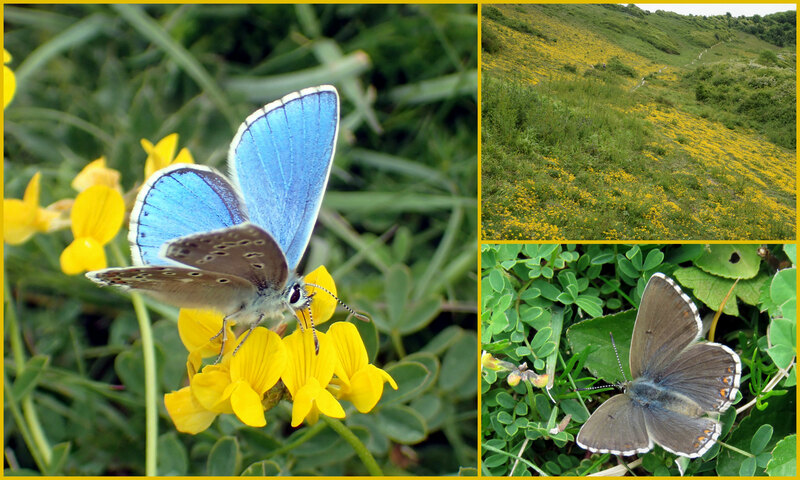 Often, the beginning of June shows a dearth in variety of butterflies as the Horseshoe Vetch, Hippocrepis comosa, nears its end with more seed pods than its yellow flowers, which are exceeded by the flowers of Bird's foot Trefoil. 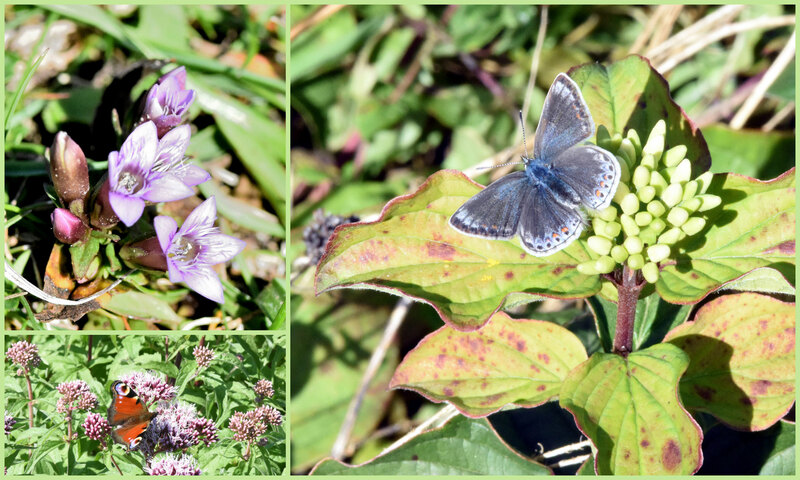 In the early afternoon on the lower slopes of Mill Hill there were still over eighty (roughly counted) blue butterflies fluttering around in the sunshine. Most of these were Adonis Blues with occasional Common Blues, all very lively with only the females settling, wings closed, to deposit eggs. Add on another twenty five mostly male Adonis Blues, quite a few in good condition, on the middle and top part of Mil Hill. 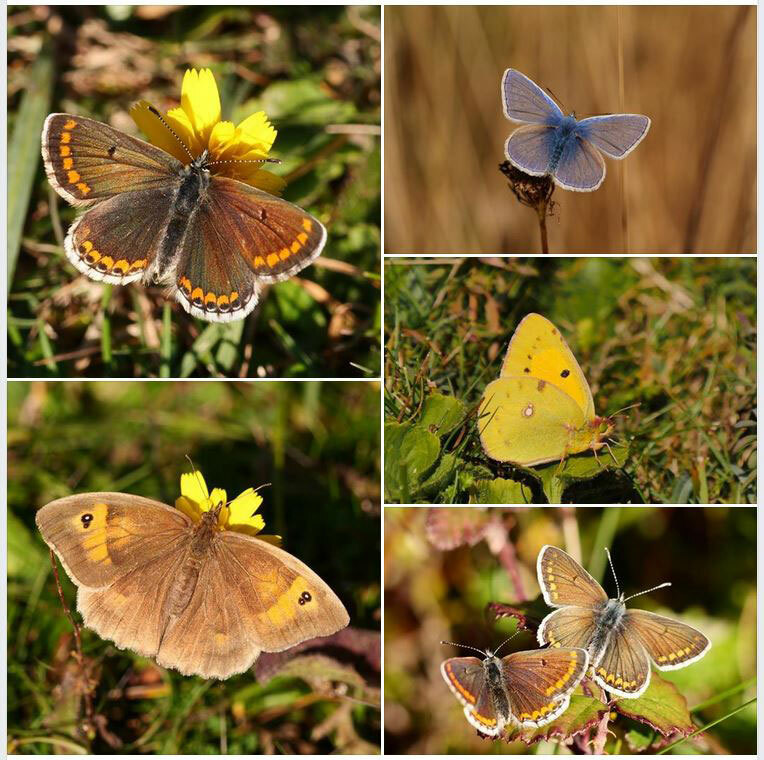 Other butterflies seen on the day were an estimated forty Small Heaths, a handful of Brimstones, four Dingy Skippers, two Painted Ladies, one Large White and my first Meadow Brown of the year. As I heard the stridulating grasshoppers and spotted a few, I disturbed at least one Cinnabar Moth and one small pyralid: a Pyrausta purpuralis. Dropwort was notably flowering even amongst the prostrate Bramble are of the lower slopes. 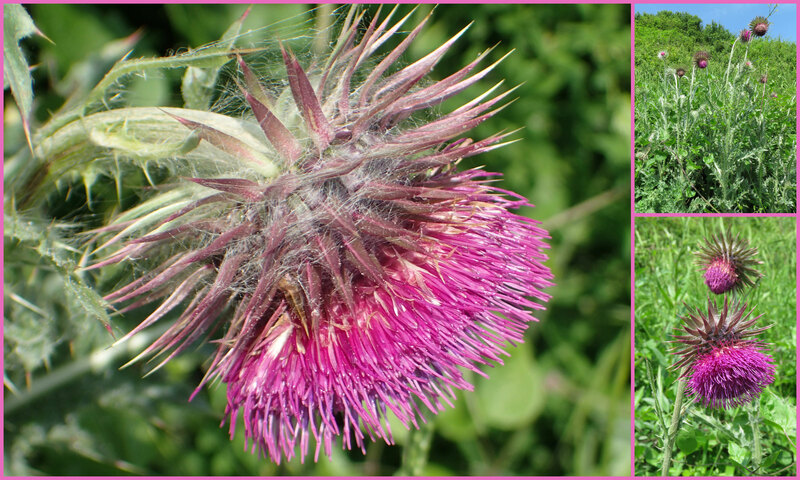 Two patches of Musk Thistle was pleasing to be seen, although this seems to be reducing over the years. Dogwood was flowering and increasing on the middle slopes. There were still a few flowers of Meadow Cranesbill amongst the grasses in the southern part at the top of the hill, but this has almost disappeared. Bladder Campion seems to thrive in the same habitat amongst long grasses. Dogs are becoming a nuisance every other visit to Mill Hill for the first time this year, running off their leads, barking at people, and two discarded poo bags as well as increased excrement. 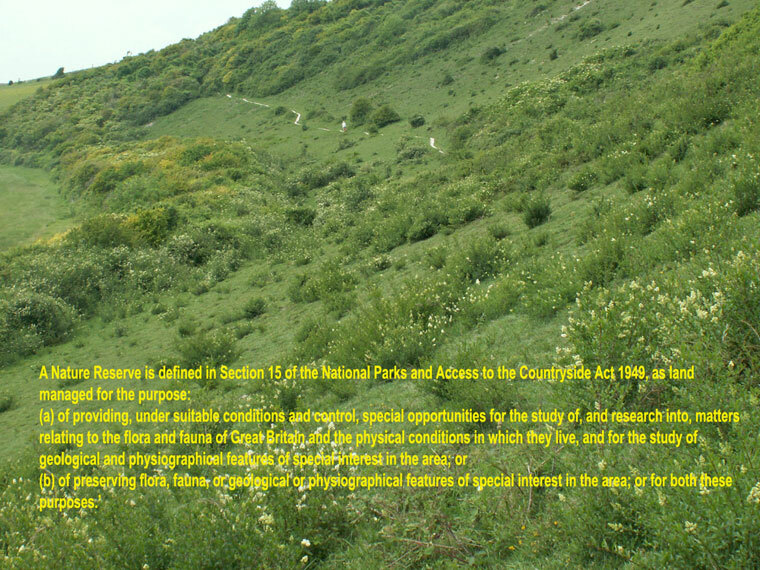 It is intolerable on a Nature Reserve. Sidelined at home for just over a week with illness (a summer virus) and unsuitable weather (predicted heavy showers and lightning) and I missed one day for bicycle repairs (awkward puncture), so the receding Horseshoe Vetch and new summer flora was expected on the lower slopes of Mill Hill, after my absence. In the afternoon an advection mist rolled up the Adur valley. Conditions were too cool for active bees and butterflies. 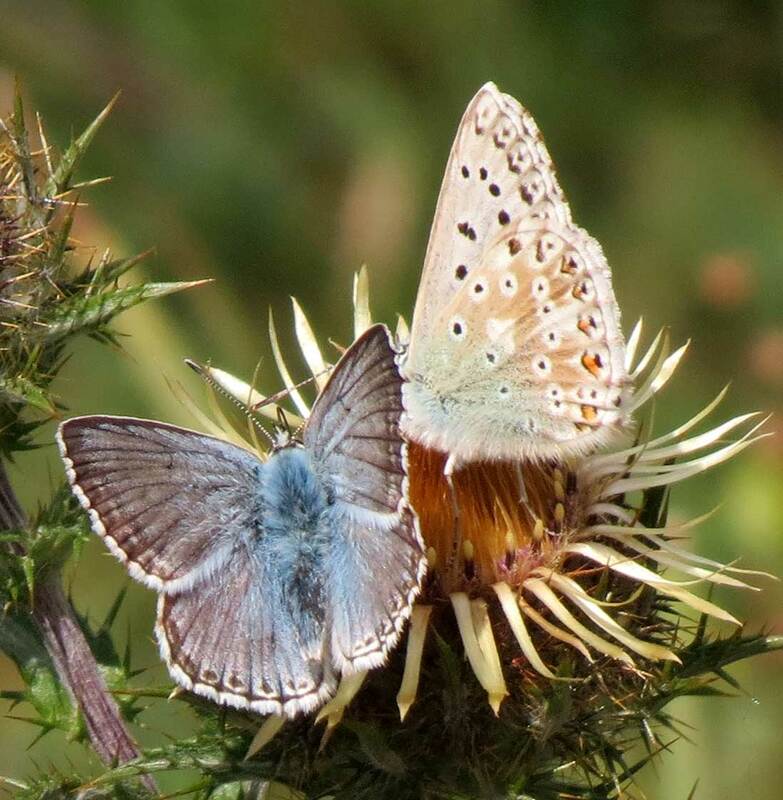 However, they were commonly found resting and the male Adonis Blues were frequently seen still in the short vegetation with their blue wings open. 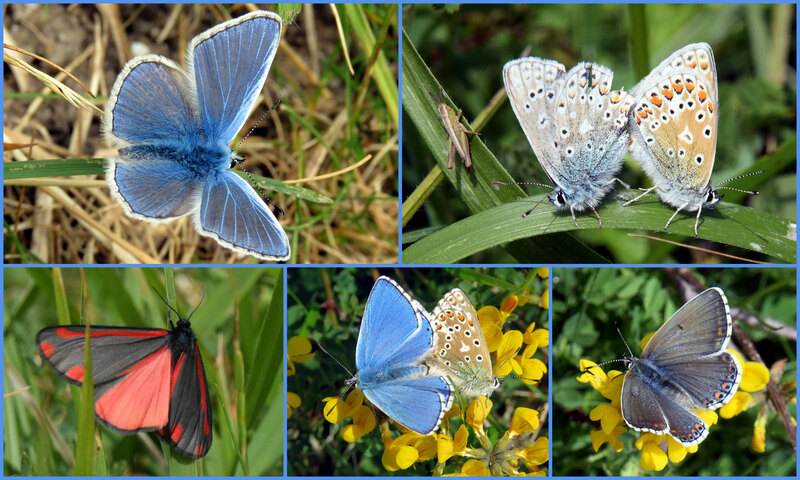 Every butterfly seen was disturbed by my passage and my tally of Adonis Blues was an estimated 135 (110 males and 25 females) in the one acre transect (counted 88 males and 17 females in the reduced transect 30 minute walk). some of the Adonis Blues were tatty and worn. Occasional Small Heath Butterflies rose from hiding and I disturbed at least one Cinnabar Moth and a few smaller moths including one pyralid: a Pyrausta nigrata. The highlight of a dull afternoon was a dozen bumblebees on a patch of unexpected Musk Thistle on the lower slopes. 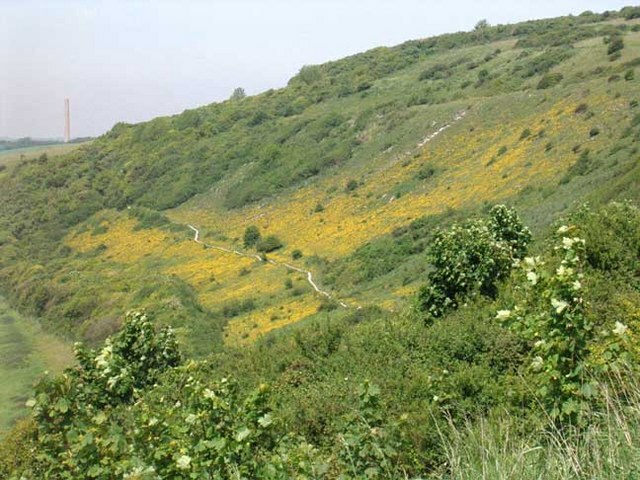 Other flowers on the lower slopes seen for the first time this year were the first Dropwort, Rough Hawkbit, the ground-hugging Creeping Cinquefoil, and the first diminutive Wild Thyme, Fairy Flax and Eyebright. Pushing through the short vegetation, the tall spikes of Yellow Wort were not yet flowering. The rolling mist turned to fog and visibility and light was poor on the middle slopes. Bladder Campion was seen flowering in a brief cursory visit. 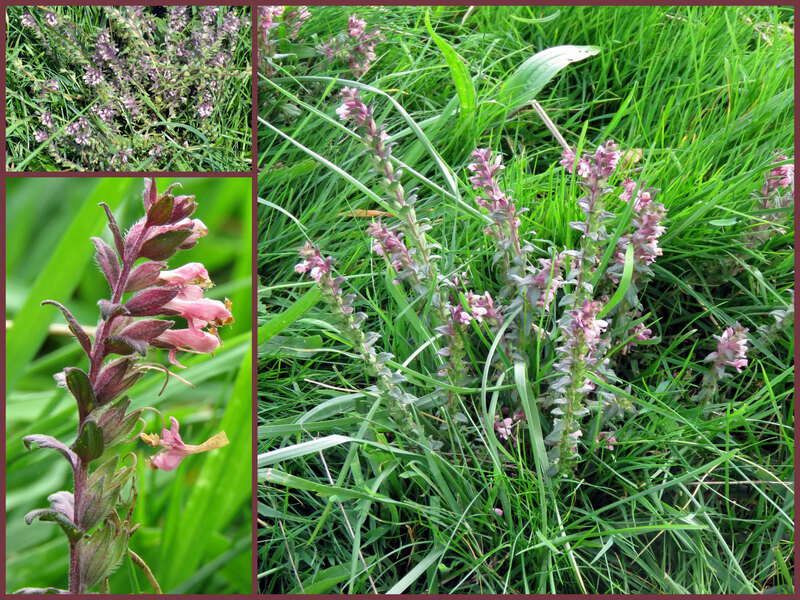 Greater Knapweed, Yellow Rattle and Ribwort Plantain were flowering amongst the long grasses south of the Reservoir. Common Poppies were flowering in mass in the meadow below Mill Hill. Dogs in packs were again seen off lead chasing Rabbits down their holes under the Deadly Nightshade by the lower path. This is how the dogs get bitten by Adders. On the Mill Hill transect with conditions overcast and damp, there was a solitary Small Heath at the top. Things were a bit better on the lower half where the tally for Adonis Blues was 184. I cycled to the upper car park on Mill Hill (as I missed out the top and gentler middle slopes on my last two visits). 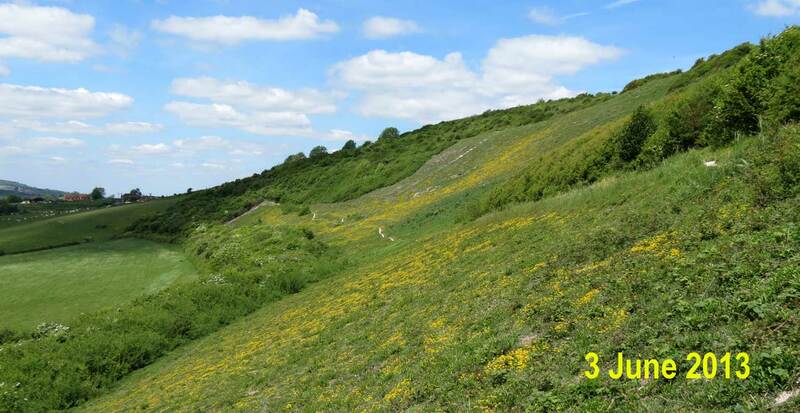 The upper plateau was covered in grasses and Bulbous Buttercups and the amount of Horseshoe Vetch was noticeable less than in previous years. Small Heath Butterflies were a frequent sight. 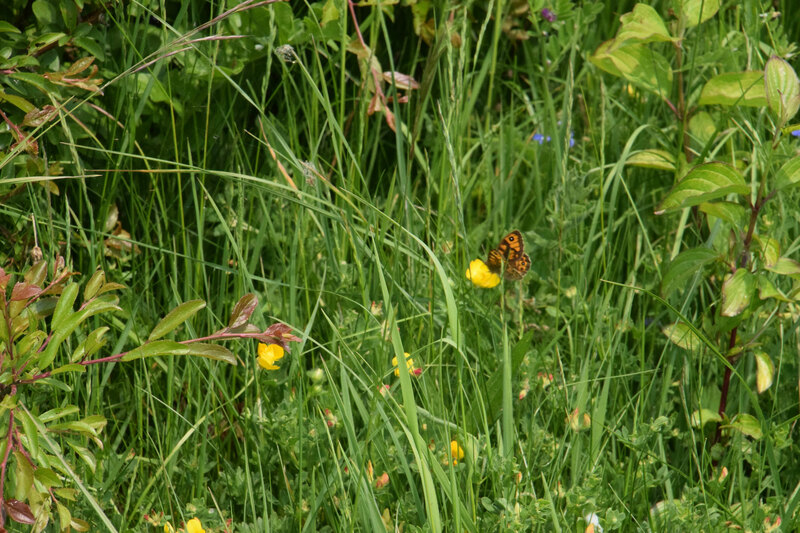 An open meadow-like area north-west of the car park hosted a mixed collection of butterflies fluttering occasionally in the sunshine. The first contestants turned out to be the first of a few male Common Blues and his surprising opponent was revealed as my first Green Hairstreak of the year. 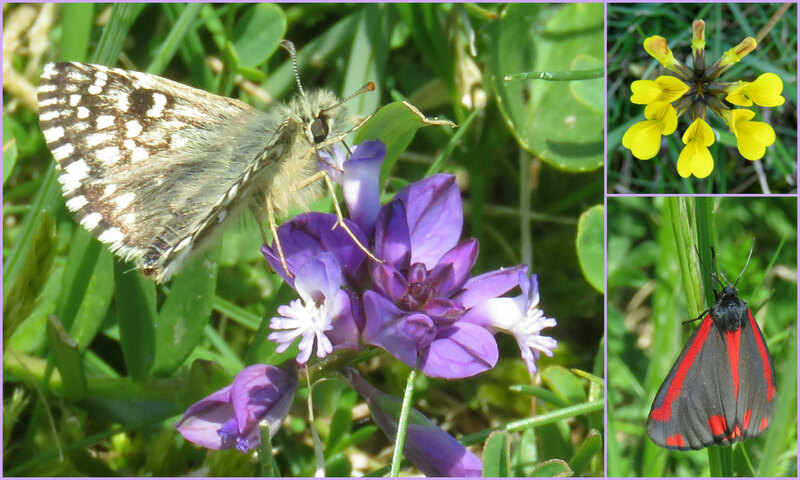 A single fine condition Dingy Skipper was querulous with other butterflies as well. 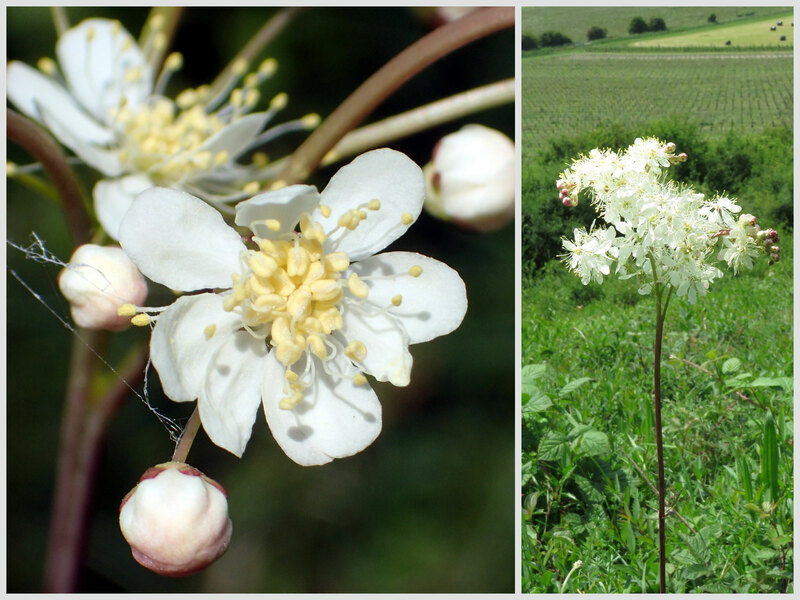 Hawthorn was blossoming near to the border to Erringham Hill. On close inspection most of the handful of blue butterflies in the meadow were Holly Blues although there was at least one male Adonis Blue. A Brimstone Butterfly and a Large White fluttered by and two Wall Browns landed briefly where passage had worn a path and revealed bare chalk. Another first of the year was a pretty Mother Shipton Moth. Melilot and Bladder Campion were just beginning to flower on the middle slopes of Mill Hill. The rough meadow north of the car park lacked anything of interest until another Wall Brown fluttered over. 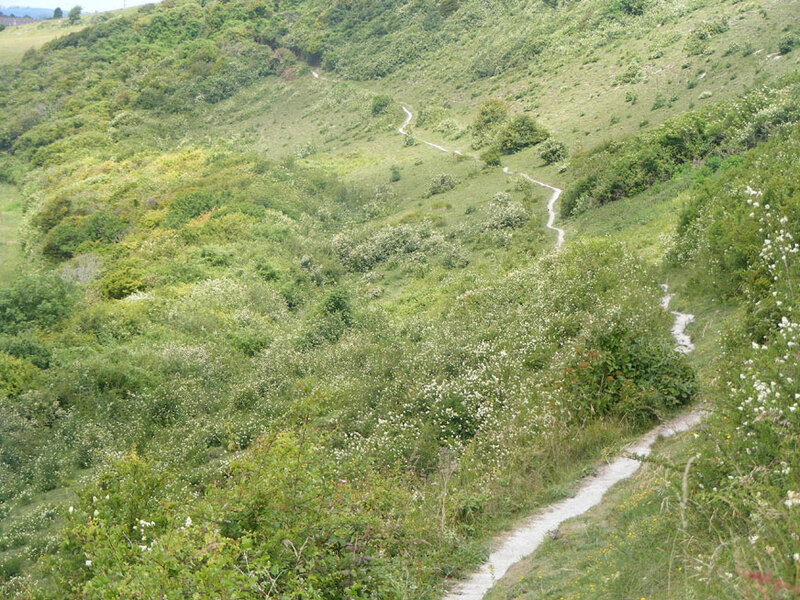 I cycled up to Beeding Hill and the top part of Anchor Bottom. But this was covered in more grasses and buttercups and despite looking, I could not find anything worth a photograph. 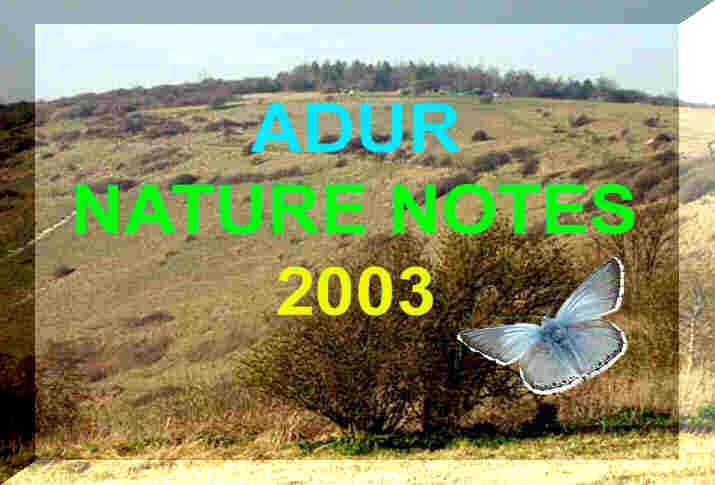 Extrapolation of the count over the five acres of the lower slopes making allowances for lower numbers at the southern end, leads to me to make a conservative estimate of 600 Adonis Blues on Mill Hill, a larger number than recorded before. I returned by the ridge route where I spotted a further dozen male Adonis Blues. 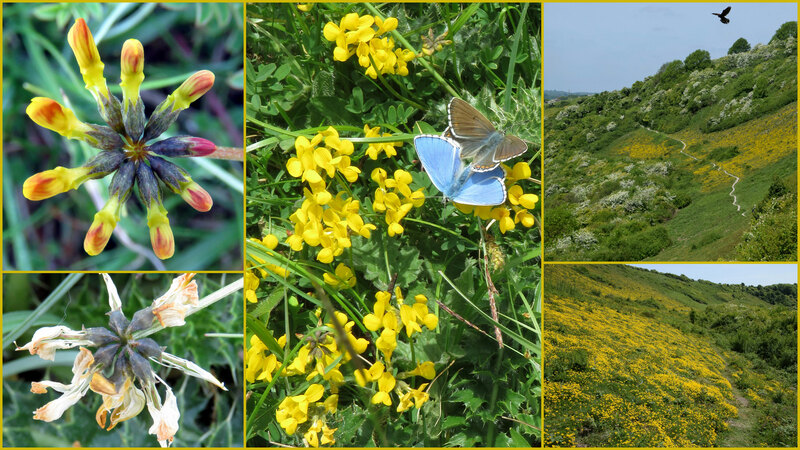 WIth the yellow carpet of Horseshoe Vetch, Hippocrepis comosa, on the lower slopes of Mill Hill, looking splendid a day or two off its peak, the butterflies were out in force, in numbers, if not variety. 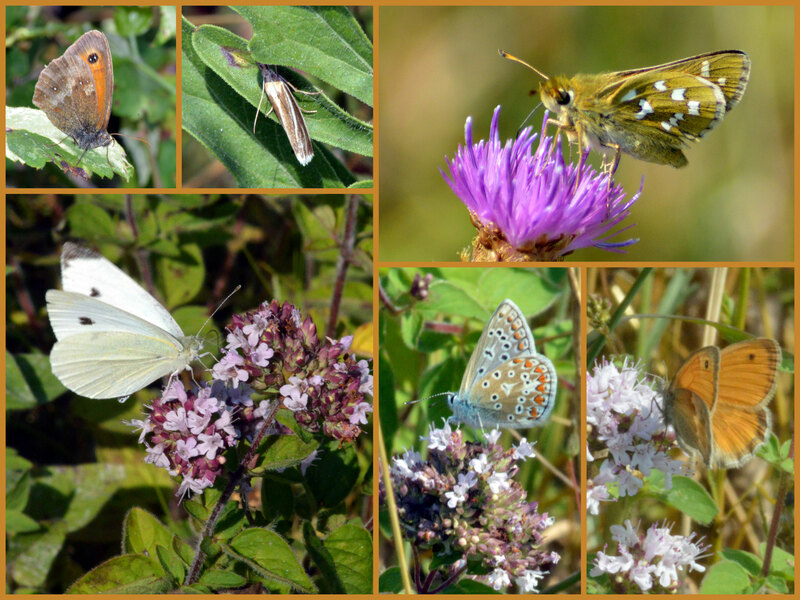 In the transect acre there were estimated to be in excess of a hundred butterflies fluttering around in the sunshine. 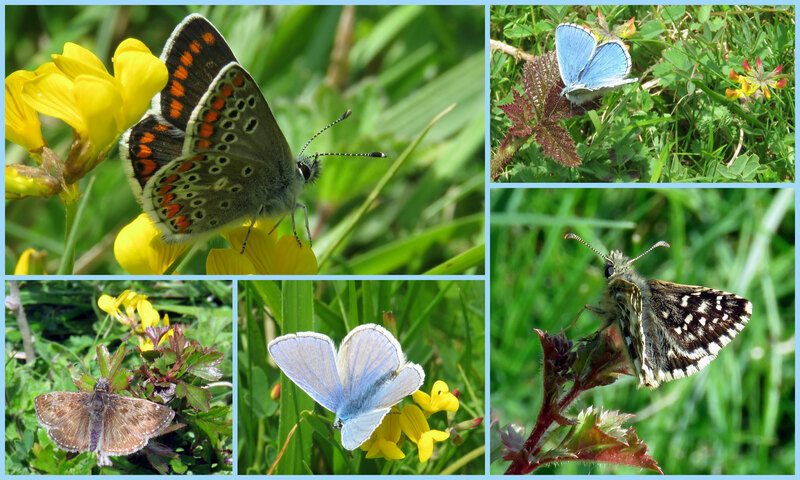 At least sixty were the lively and amorous male Adonis Blues, and the rest were made up of female Adonis Blues, frequent Common Blues, frequent Small Heaths, occasional Grizzled Skippers and Dingy Skippers, and a few Brimstone Butterflies and Small Whites. 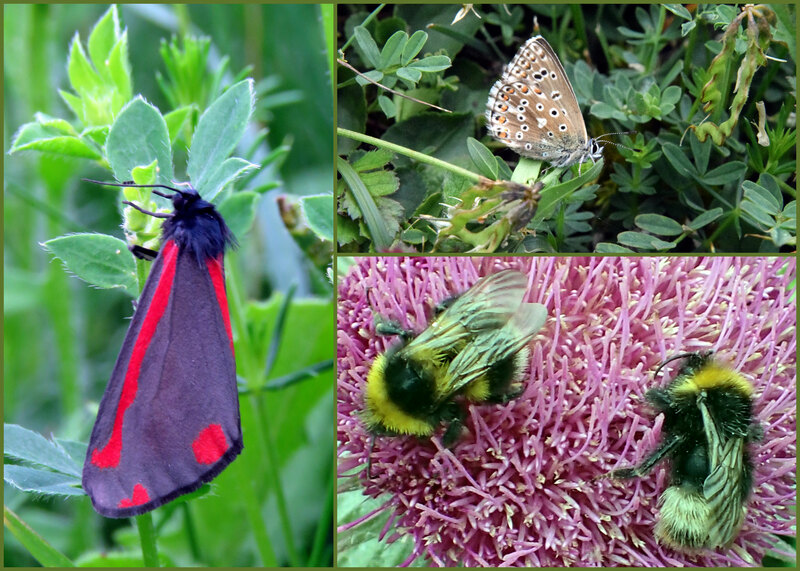 I spotted at least one Cinnabar Moth on the lower slopes, and one Carpet Moth where the cattle had disturbed the flora and spoilt the habitat by the water trough. There was almost an absence of the micro-moths that are usually so common, no Pancalia and just the one pyralid: a Pyrausta purpuralis. The only surprise of the early afternoon was a very quick male Broad-bodied Chaser (dragonfly) chasing after the skippers. A few Azure Damselflies were seen around the Brambles. 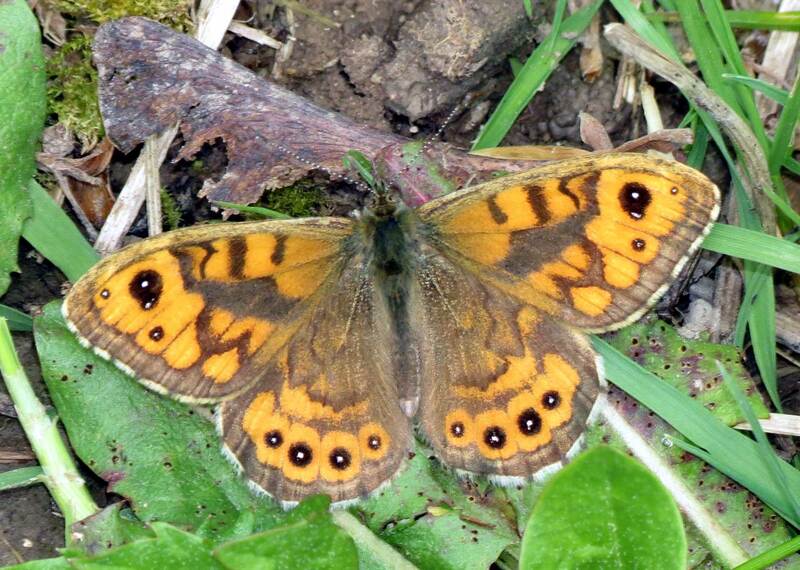 There was a brown butterfly over the southern steps which was either a Wall Brown or a Speckled Wood. 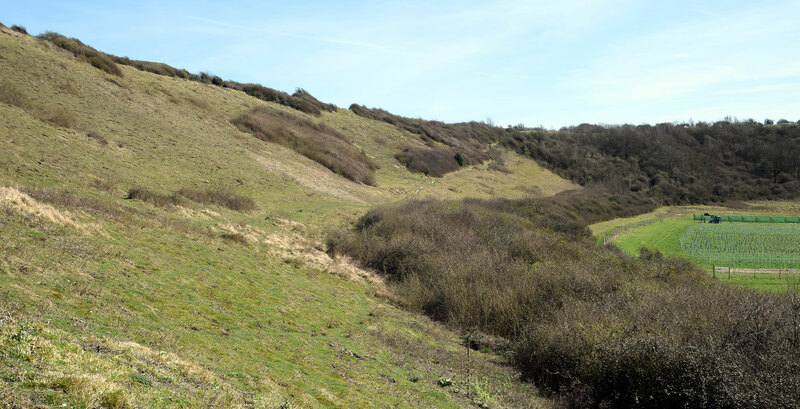 TheHorseshoe Vetch was dominant on the lower slopes except for one Bramble-covered bare patch which I put down to mismanagement. A few diminutive, Milkwort , Germander Speedwell and Scarlet Pimpernel, and taller Salad Burnet interrupted the blaze of yellow. I noted the much larger Hound's-tongue in bud near the scrub. 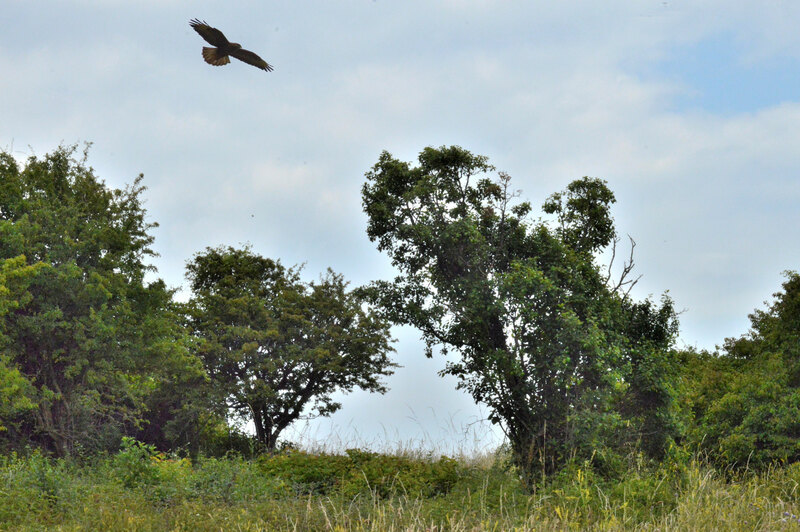 When the pack of dogs had moved off the hill, the Kestrel hovered over edge of the Hawthorn-flowering scrub. A couple of adult Slow Worms were hiding under a piece of wood at the top. I was satisfied with only visiting the lower slopes. Hawthorn was in blossom all over Mill Hill and most be about 60% of full flowering. Likewise the yellow swathes of Horseshoe Vetch, Hippocrepis comosa, were more than half in flower, attracting the bees and butterflies. 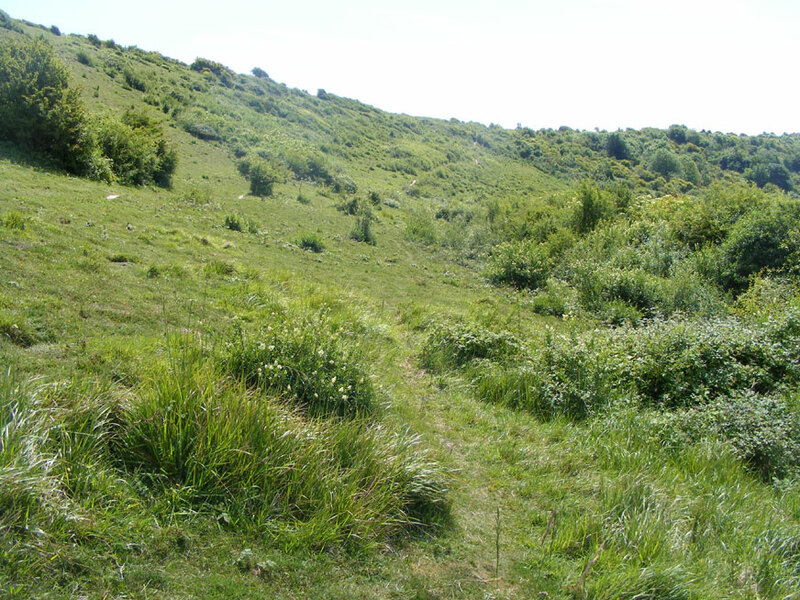 The annual photographs show large bare patches where Horseshoe Vetch used to be prevalent in 2006. 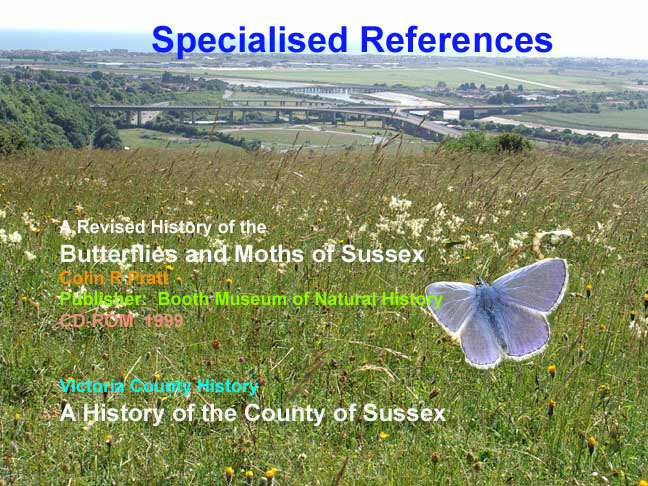 It was only on the lower slopes that butterflies and moths were frequent if rather patchily distributed. The first of 9+ Grizzled Skippers were immediately seen from the southern steps. But I was simultaneously distracted by two Cinnabar Moths which I may have disturbed. 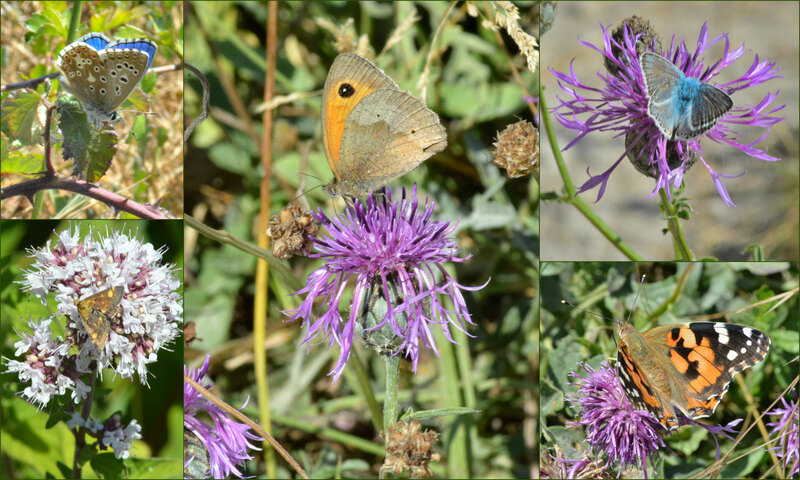 Small Heaths (15+) were chasing other butterflies around all over the place. 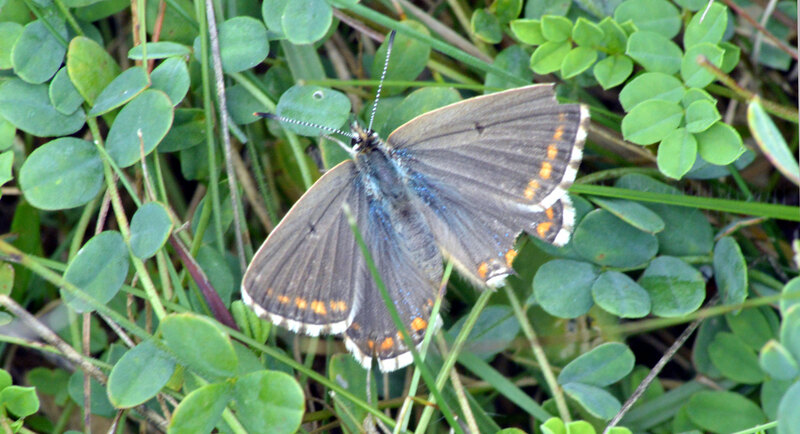 They prevailed over at least two surprise clearly seen Brown Argus. 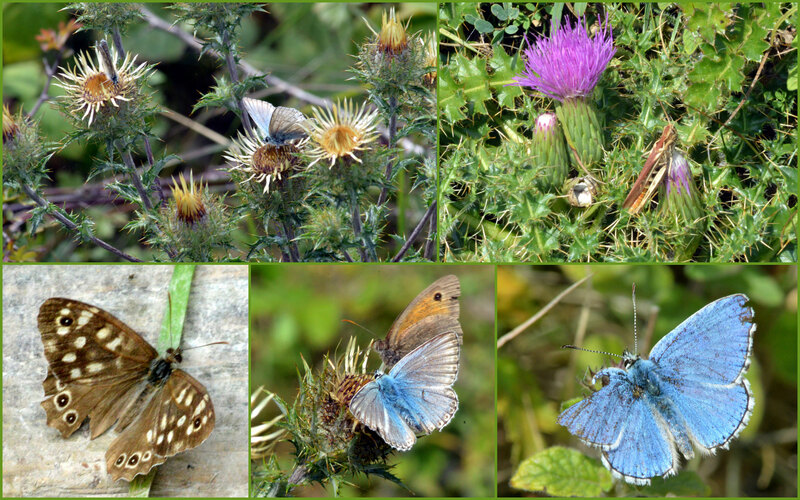 All this before I spotted my first dozen or so blue butterflies, mostly quarrelling with other butterflies and skippers and not keeping still. 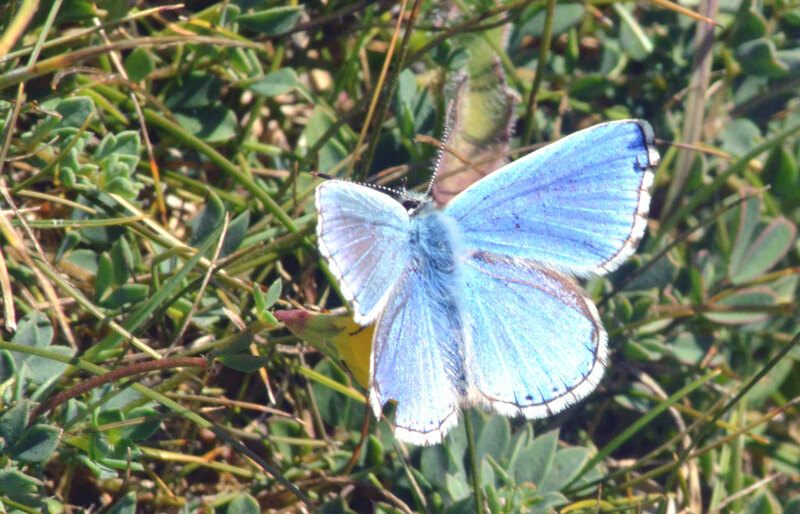 The first recognised were the slightly more numerous (8+) male Common Blues, but at the same time there were at least five male Adonis Blues. They were causing such a commotion with each other that it was difficult to count them. Dingy Skippers were seen all the time, rarely keeping still, but the count was only five as one kept flying to and fro. An Azure Damselfly,Coenagrion puella, avoided the melee. A pale flutter was a Treble-bar Moth. 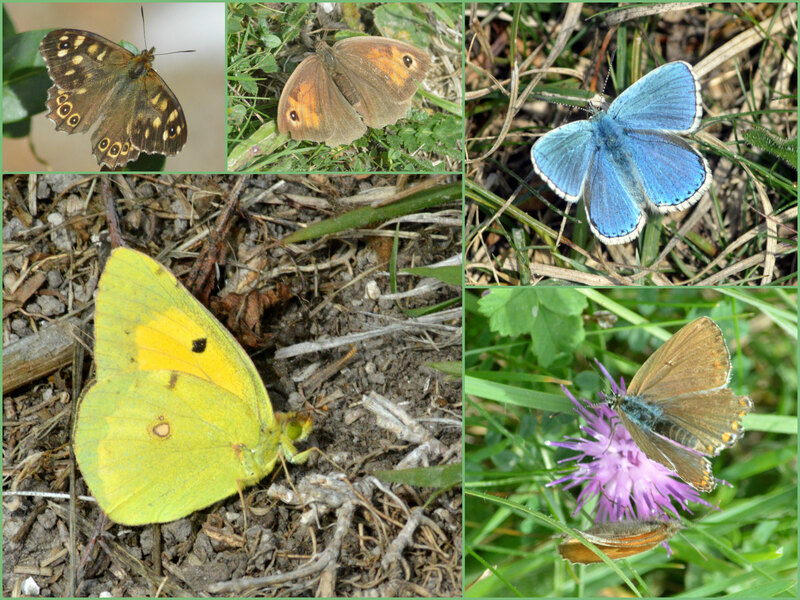 A few Brimstone Butterflies patrolled the thickets/hedge and the larger brown butterfly was seen to be a Wall Brown. I did not note any of the very small moths. A few small white butterflies, on the top of the hill, were not positively identified, but were most likely Green-veined Whites. A large adult Slow Worm slithered into hiding on the top southern part of Mill Hill. More of a surprise was the skitter of a very small Common Lizard amongst the vegetation and green grasshopper nymphs of the sheltered lower slopes. In the top copse, gusts of wind blew the Garlic Mustard horizontal and flat at times. I haven't had a chance to get to Mill Hill for awhile so with the prospect of fading sunlight I headed there at lunchtime. What a difference a couple of weeks makes. The place was alive with Dingy Skipper, Grizzled Skipper, Small Heath. A single Green Hairstreak was seen and about 6 male Common Blue and 6 male Adonis Blue and 1 female. Hawthorn was starting to flower in the hedges. Butterflies were out in the baking sunshine with my first Large White of the year at the top of Chanctonbury Drive (south-east of the Mill Hill Road Bridge). On the southern part of Mill Hill, I spotted my first of the year Small Heath almost immediately followed a clear sighting of at least two Green-veined White Butterflies. Down the steps on to the lower slopes where it was shimmering warm and the first Horseshoe Vetch, Hippocrepis comosa, was flowering. The flowers attracted occasional (10+) Dingy Skippers which were not allowed to settle by frequent (20+) agonistic Small Heaths. Small moths flitted amongst the intertwined leaves including small Pyrausta moths with a definite Pyrausta nigrata and Pyrausta despicata. Two Brimstone Butterflies fluttered overhead and I disturbed two very fresh Wall Browns. Only after ten minutes did the first of at least ten fresh, lively and amorous Grizzled Skippers appear. A brightly coloured Cinnabar Moth fluttered around but would not stay still as usual. Crane Flies were frequently seen on the lower slopes. 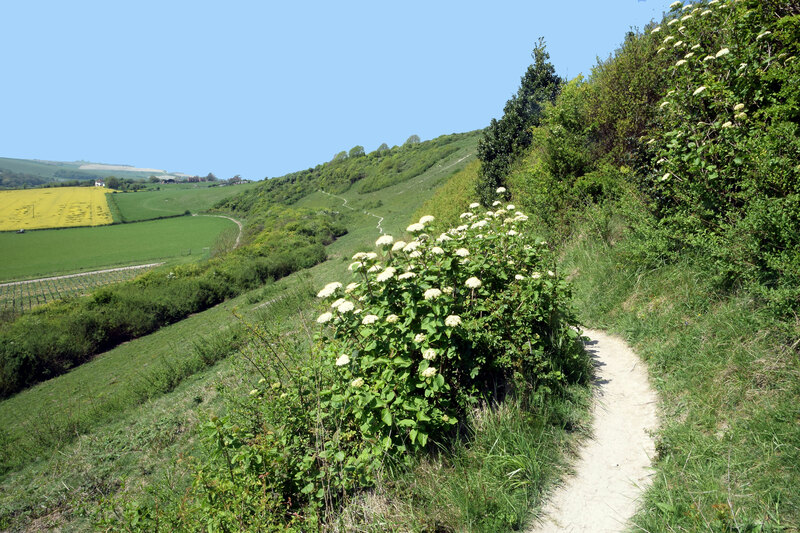 A large clump of Wayfaring Tree was in flower next to the path down to the lower slopes. The small Milkwort flower appeared but mostly blue ones were seen. 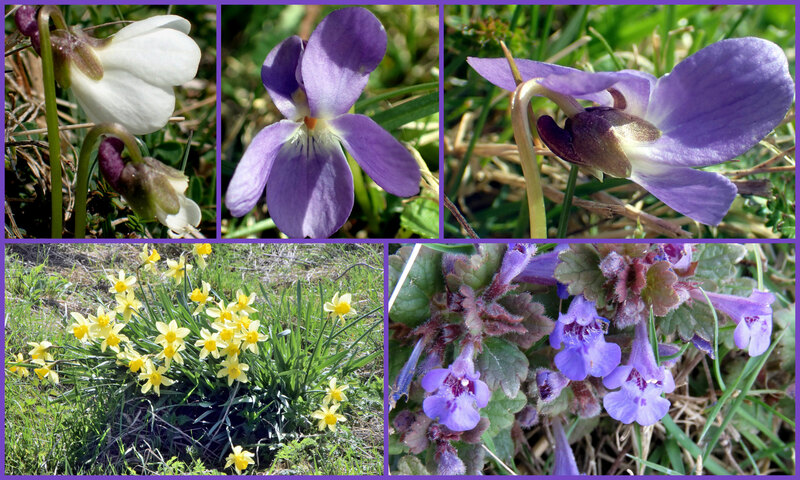 But they exceeded in number over the few remaining Dog Violets. There were still patches of Ground Ivy and the new Germander Speedwell. A black and yellow hoverfly Xanthogramma pedissequum flitted amongst Stinging Nettles on the southern steps. It was so warm that I returned by the path without completing the full transect. Cowslips were in flower on the southern top part of Mill Hill. 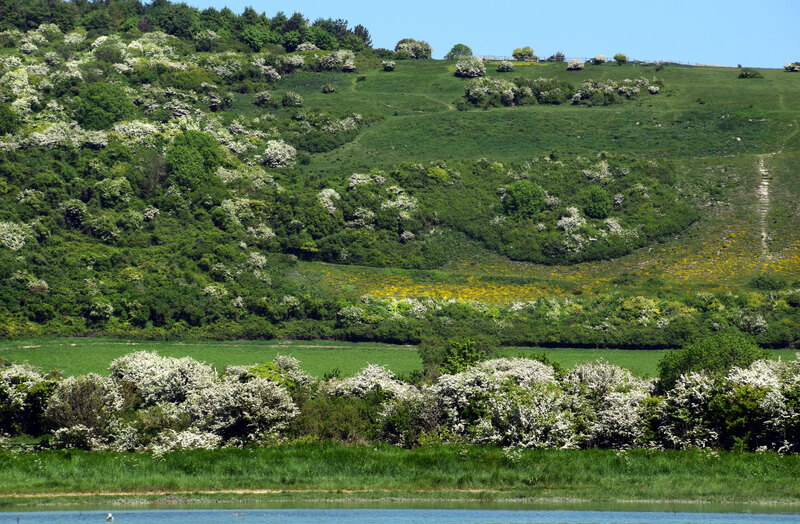 After the recent sunny spell of a few days, the mud on the southern steps down to the lower slopes of Mill Hill has already dried out and the Blackthorn was in blossom everywhere. It was even too warm for diligently spotting butterflies and on the lower slops where on passage I noted a mere one Speckled Wood, 2+ Peacocks, a Brimstone or two, one Small White, and frequent small Pyrausta moths. Too warm for packs of dogs and there were only four butterfly watchers who reported Grizzled Skippersand a Green Hairstreak. It was really too warm for me as well and I did not stay long in the afternoon. Common Bee-flies visited Ground Ivy and Dog Violets. My first adult Slow Worm of the year was seen under a flat piece of wood on the southern top part. A Kestrel flew over but this regular inhabitant of Mill Hill has a tendency not to stay around when there is even one dog, however small. A Wren was making more noise than the buzz of the traffic, the drone of small aircraft and the baaing of the sheep in the field below. Earlier in the day there was more than one hearsay report of Red Kites over Erringham Hill flying towards New Erringham. A disturbing visit to the lower slopes of Mill Hill, spoilt entirely by 18 dogs and four people all at one time on the lower slopes. 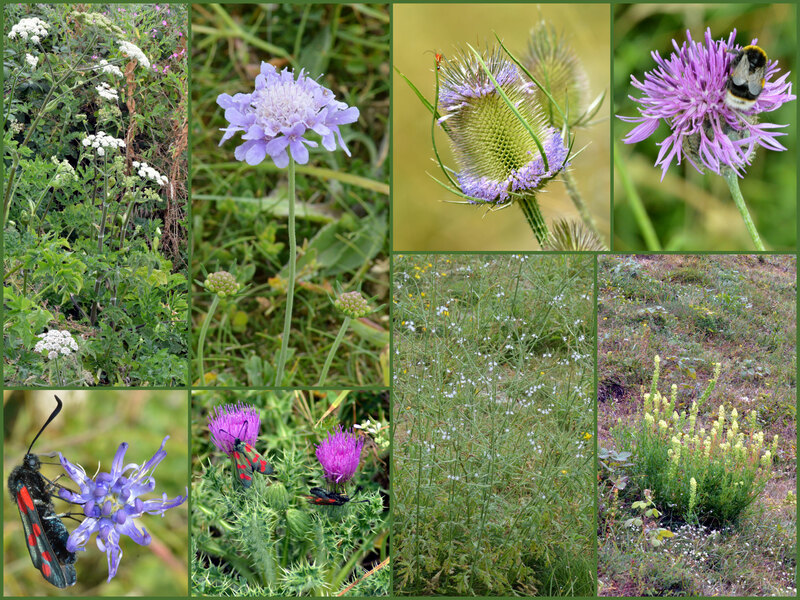 The dogs were yapping and running free and leaving their mess over the chalkhill flora. Two dogs were barking repeatedly at me over a distance of 12 metres in separate incidents. I wish I had not bothered as the steps and paths were muddy and nearly treacherous caused by excessive footfall. In the middle of the day I did spot a handful of Brimstone Butterflies and the same number of Peacock Butterflies. 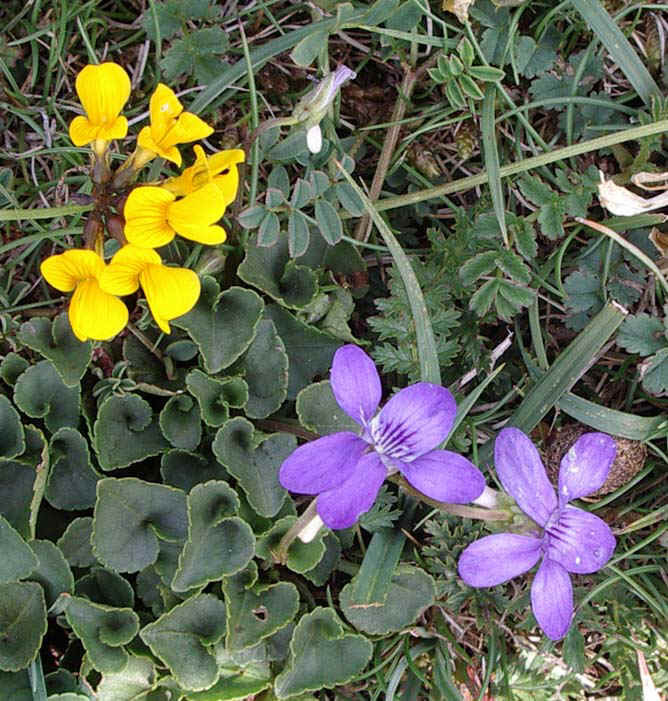 Dog Violets had already taken over from Sweet Violets as the dominant violet over the lower slopes. 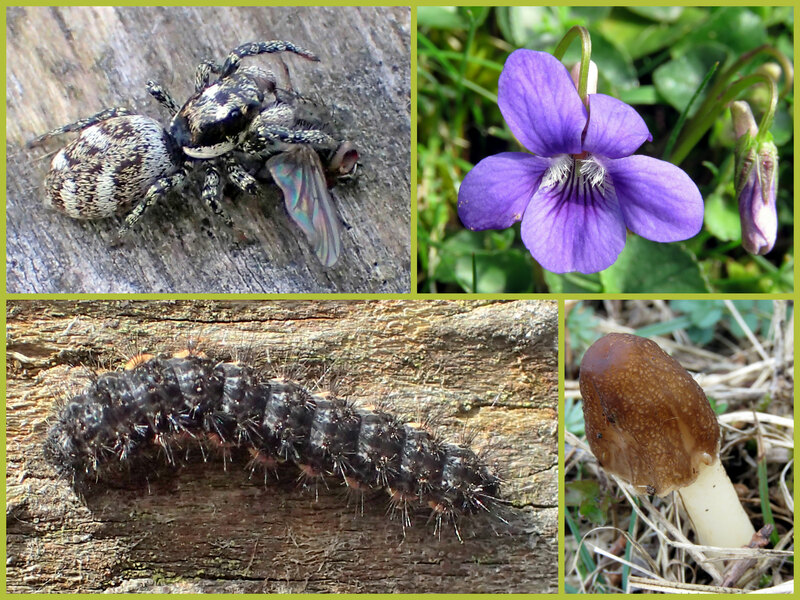 After the rain there was a mushroom I had not seen before on Mill Hill, and a Common Bee-fly visiting violets. I looked for possible Grizzled Skippers but even the dead remnants of Carline Thistle in which they hide were hardly present. 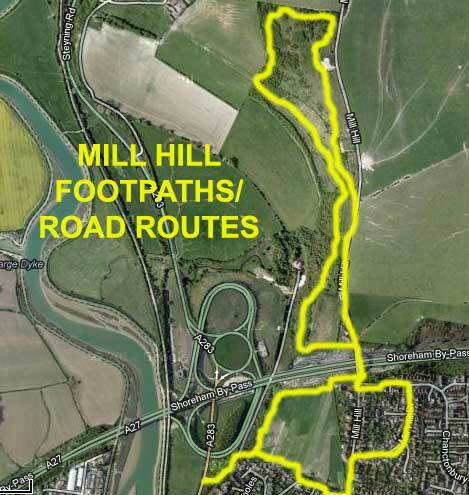 I was so depressed by the state of Mill Hill Nature Reserve and the dogs that I hurried home by the ridge route. There were a few Blackthorn flowers south of the Reservoir but there were no sign of flowers on the main clump next to the road. 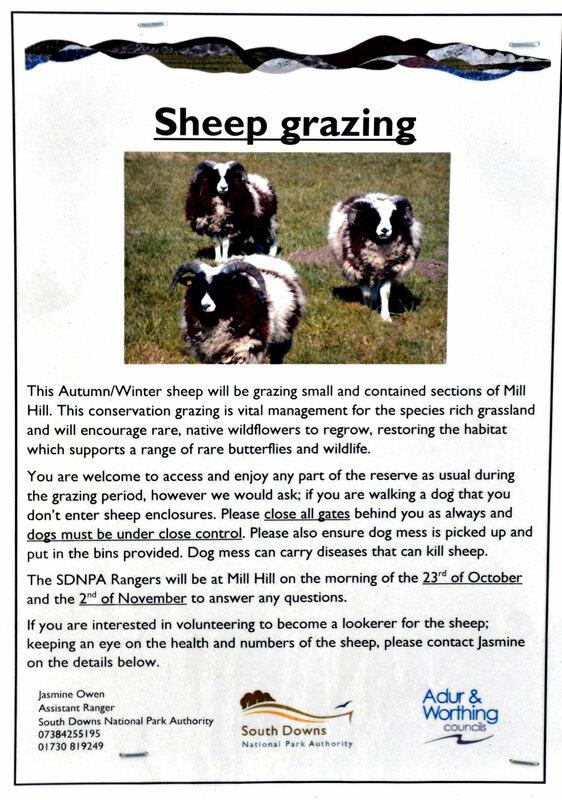 NB: The bye-lawsfor Mill Hill Nature Reserve state that dogs should be on a lead (interpreted to mean under close control, not in packs running around free). 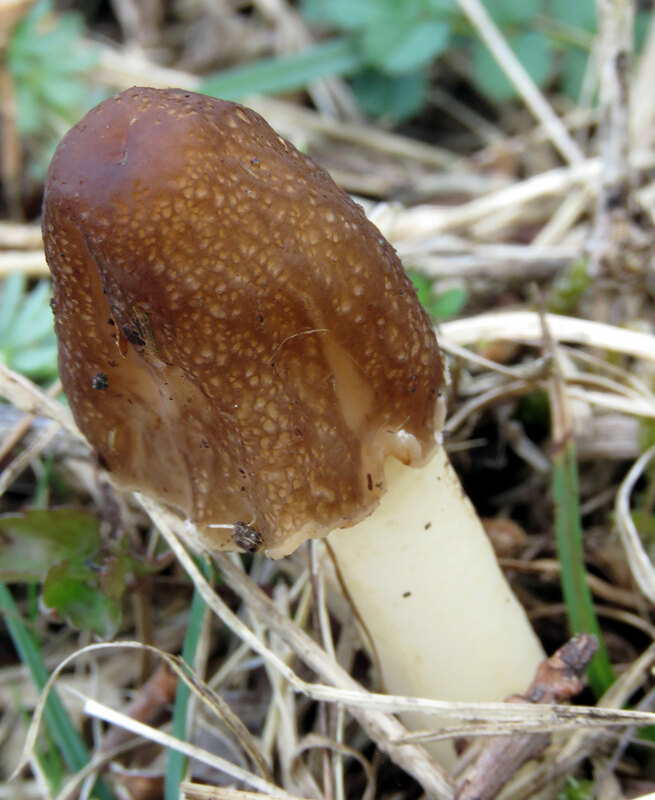 Three Thimble Morel, Verpa conica, mushrooms were the first I have ever seen anywhere amongst some grass below the path on the middle area of the lower slopes of Mill Hill. Still a slight chill under the cirrus blue sky as a Buzzard glided over Erringham Hill and a Kestrel hovered over the edge of the ridge on Mill Hill above the steep part of the lower slopes. They did not remain on station for long before they were disturbed by an excessive number of dog walkers. Sweet Violets were commonly spread over the lower slopes but not abundant and the flowers were a bit bedraggled after the recent rain which left the steps and paths muddy but passable. Ten Peacock Butterfliesflew past me and settled very briefly (not on the violets) and seven of these were on my lower slopes one acre transect. I spotted a pair of Small Tortoiseshells, my first of these butterflies of the year, near some short growths of Stinging Nettles on the edge of the scrub on the middle slopes. Buff-tailed Bumblebees were frequently seen and I noted one Common Bee-fly, Bombylius major, on a path through the scrub. A Cherry Plum was spotted in flower but there was no sign of any Blackthorn flowers. Lastly, a Red Admiral settled on the Chanctonbury Drive lawn at the south-eastern end of the bridge over the A27. In the weak sunshine I spotted my first butterfly of the year; a Red Admiral over Mill Hill Road at the southern end of the bridge over the A27. 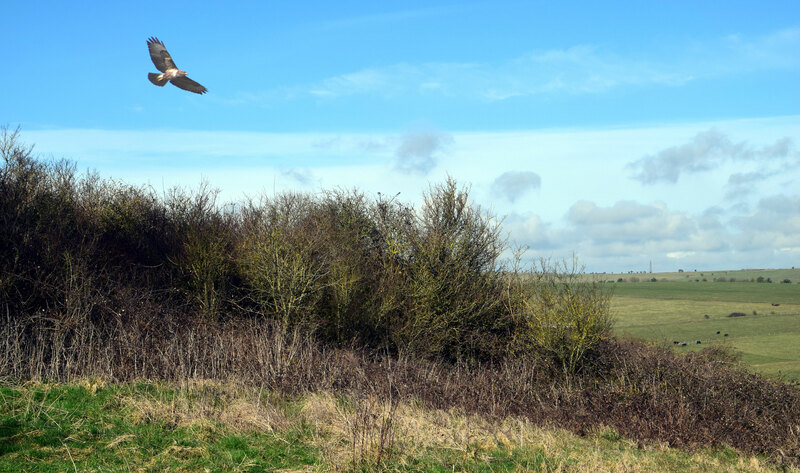 A Buzzard glided over Erringham Hill, seen in the photograph from the top meadow of Mill Hill Nature Reserve. 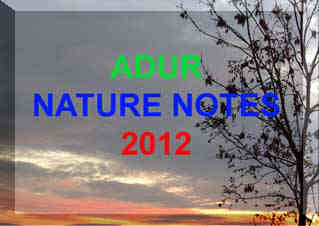 On a cloudy day with a chill breeze, I would have been lucky to see anything of note. The best I could manage was a one second peek of a rodent scurrying into hiding. It was not even long enough to be sure of what it was? It qualifies as my second wild mammal of the year. It was very rapid with a short white tail and I think it was a Mouse (rather than a Shrew). There was evidence of the activity of Moles on the top of the hill, with mounds of grey-brown earth. The dead remnants of Carline Thistle seemed less than usual. 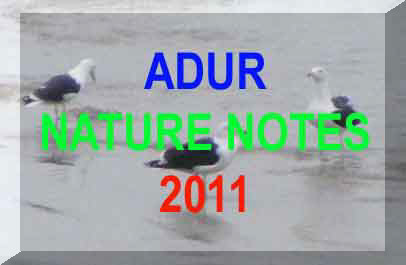 Birds were not showing and the sky was empty apart from a few gulls and a Crow. The thorn was bare and hosted a Robin. A young Song Thrush was seen on the top plateau.